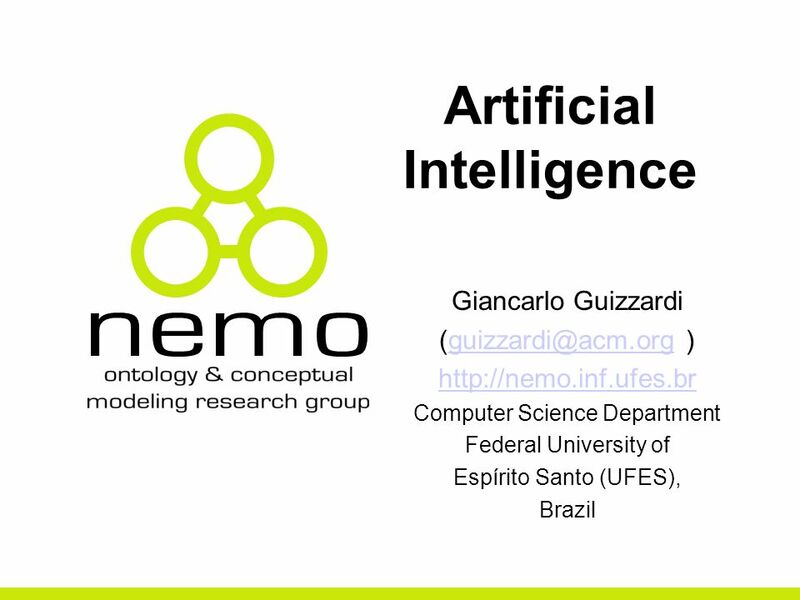 Artificial Intelligence Giancarlo Guizzardi Computer Science Department Federal University. 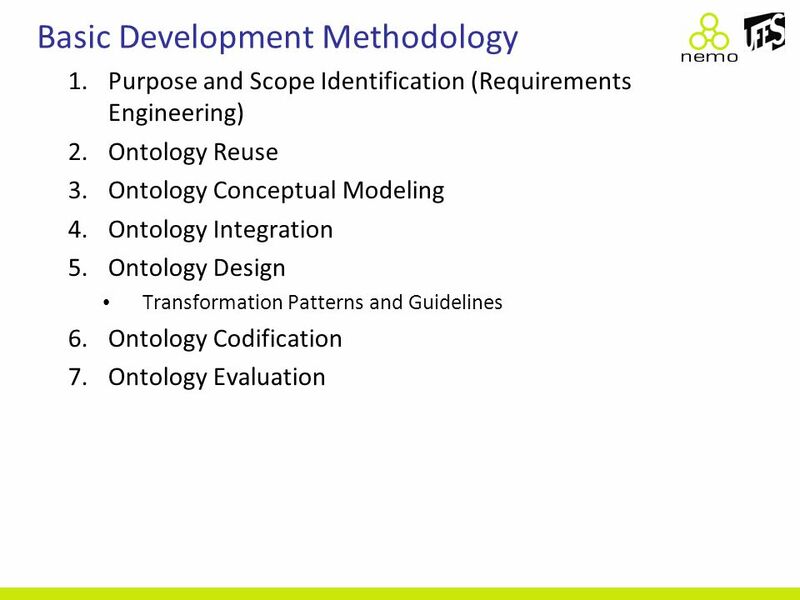 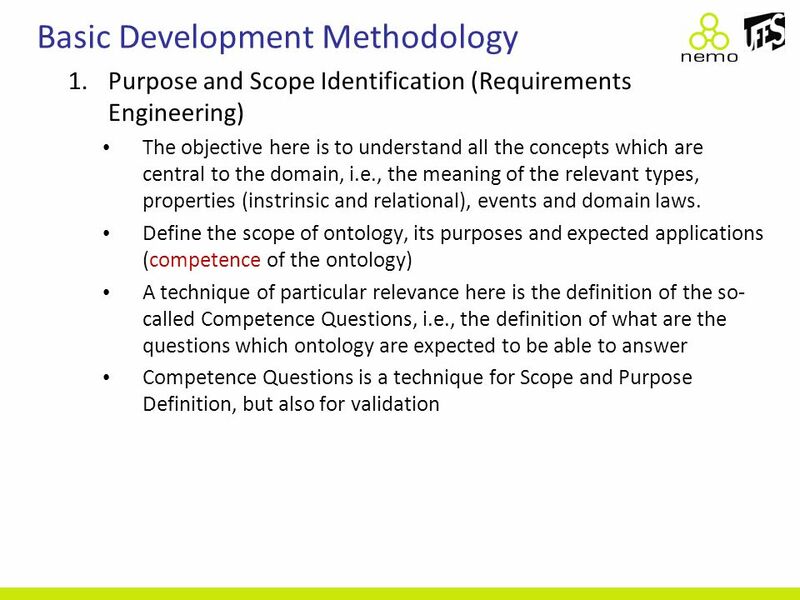 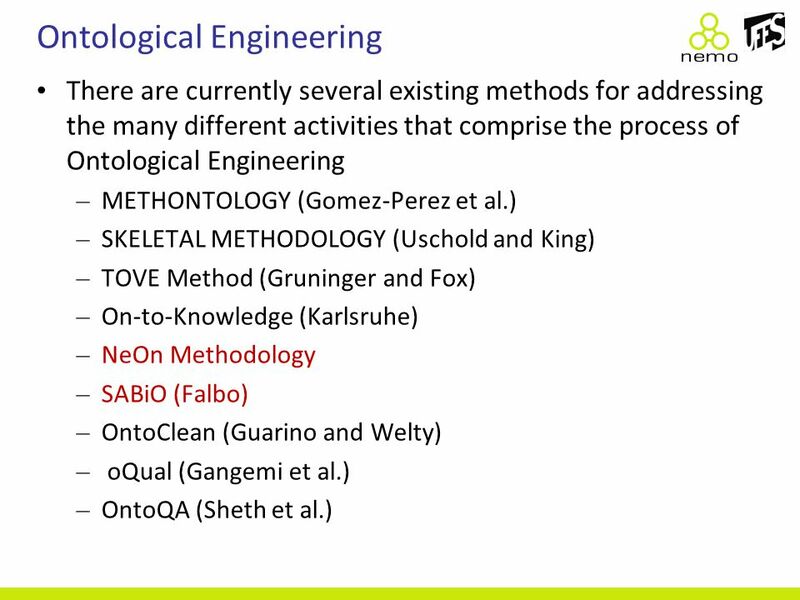 11 Basic Development Methodology 1.Purpose and Scope Identification (Requirements Engineering) Scope definition is a critical aspect since several different (correct) ontologies can be defined for the same domain with different scopes in mind In any case, try to be as generic as possible. 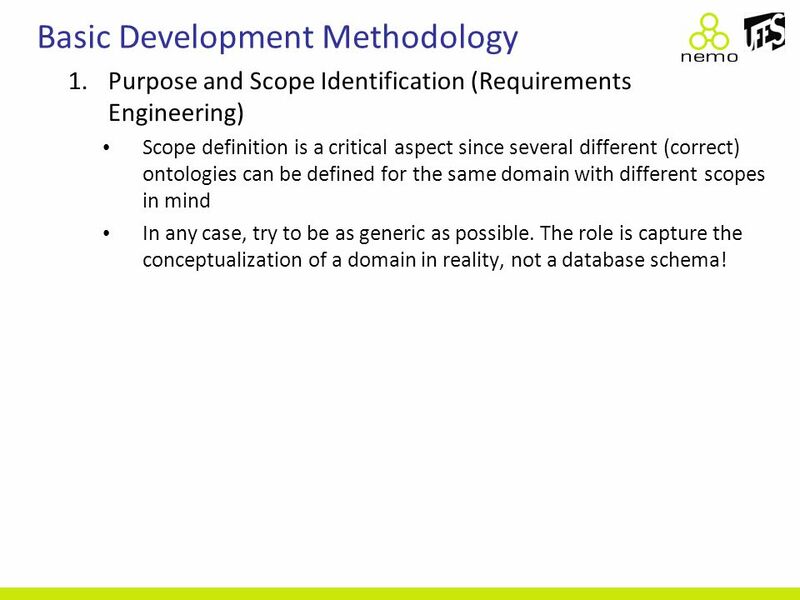 The role is capture the conceptualization of a domain in reality, not a database schema! 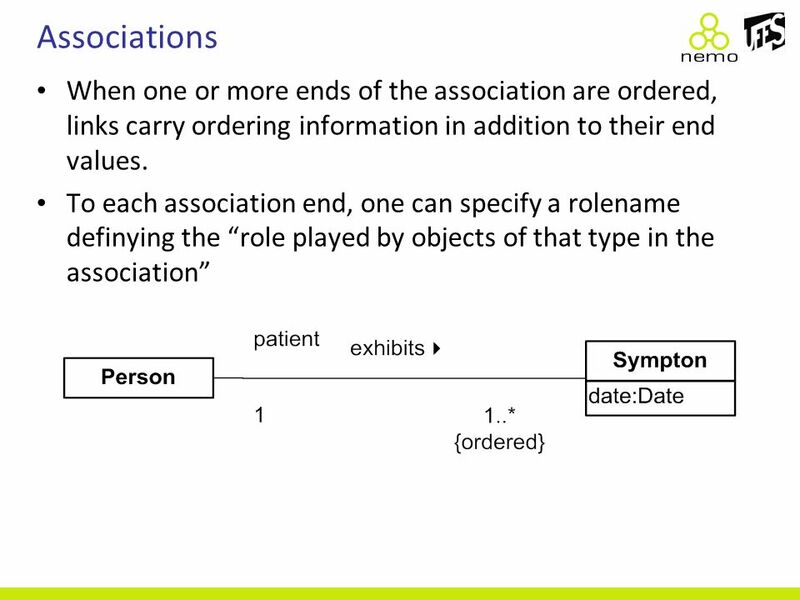 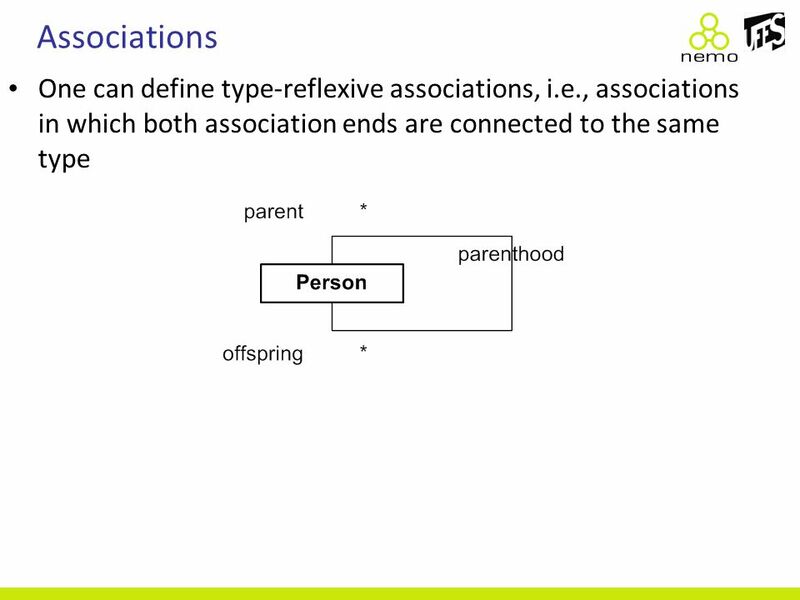 28 Associations An association declares that there can be links between instances of the associated types. 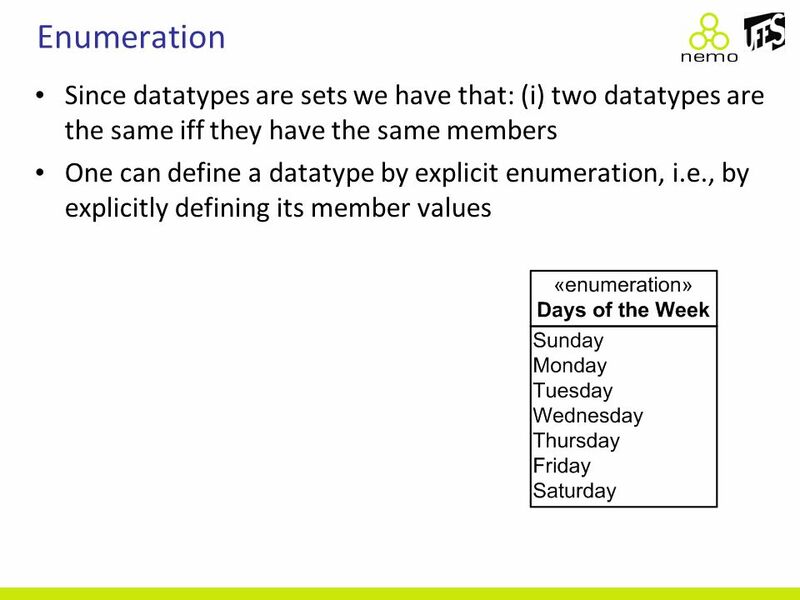 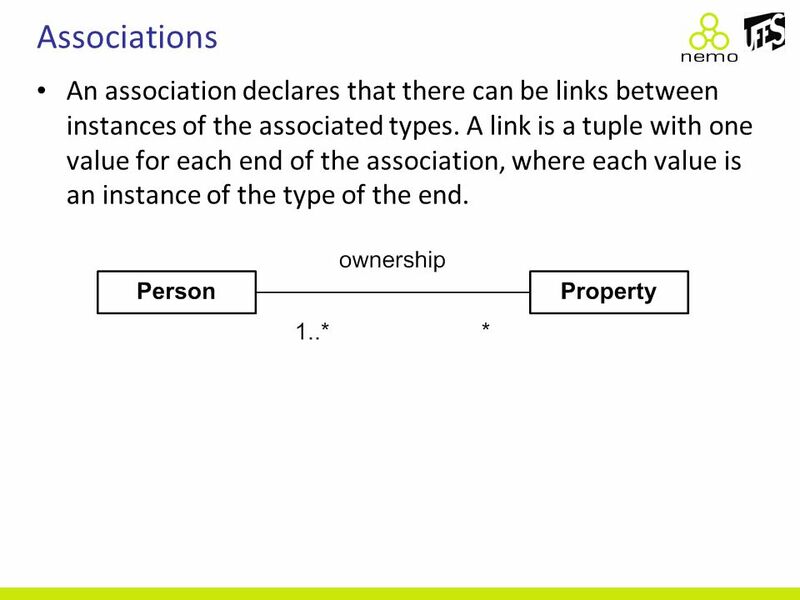 A link is a tuple with one value for each end of the association, where each value is an instance of the type of the end. 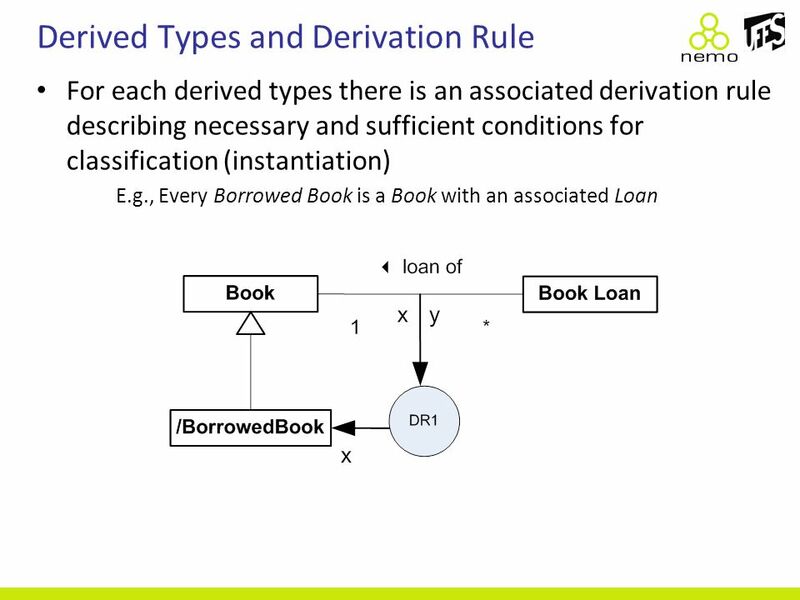 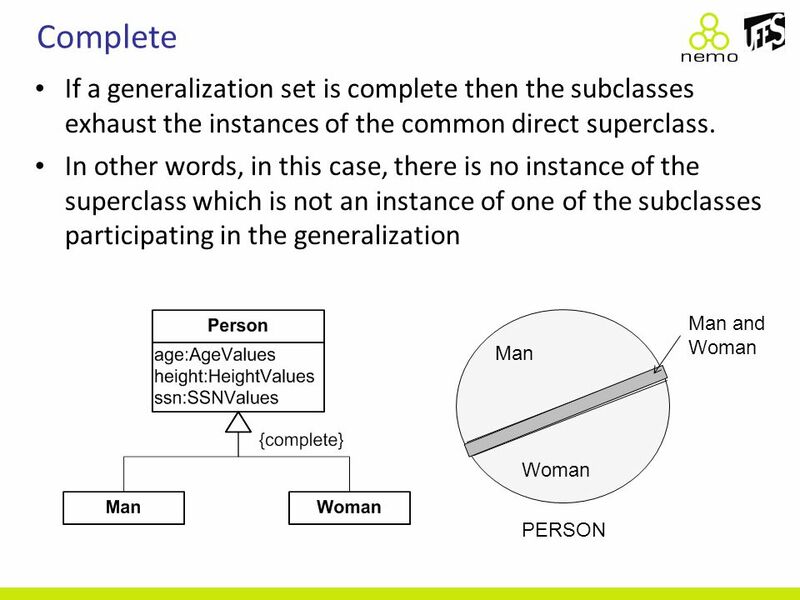 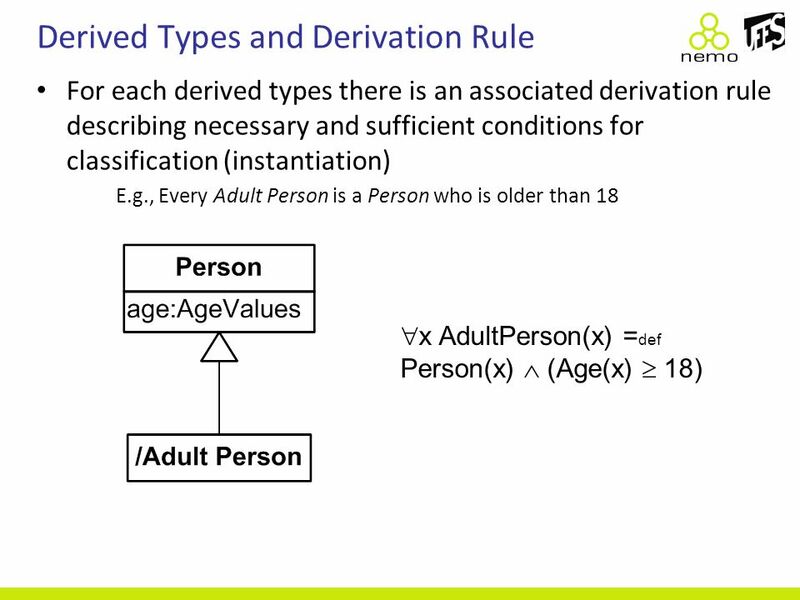 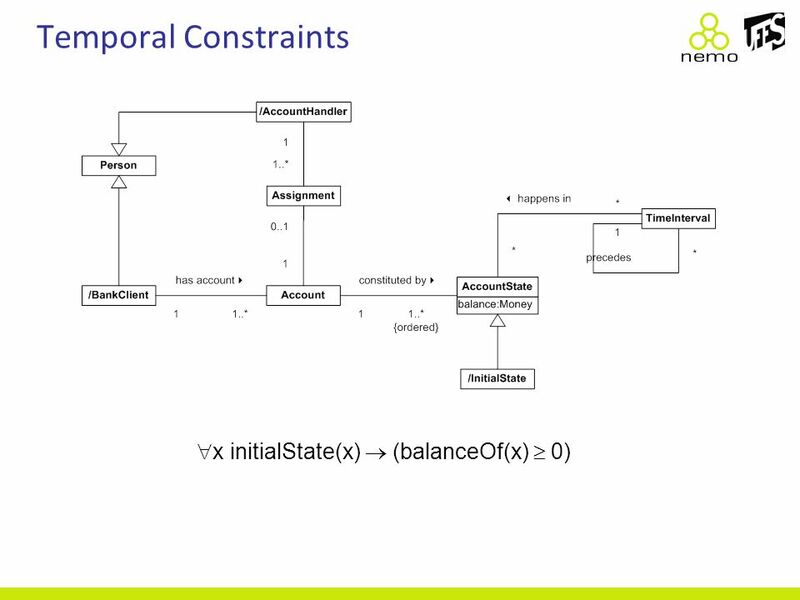 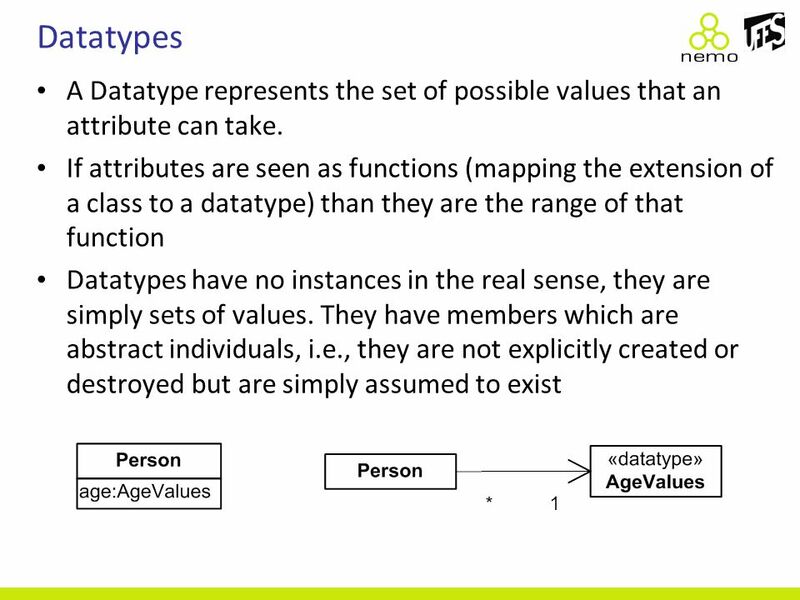 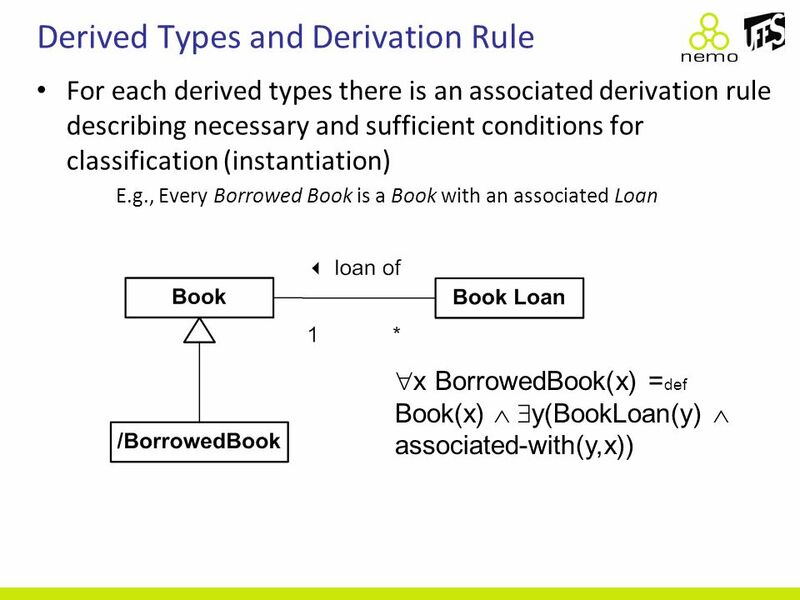 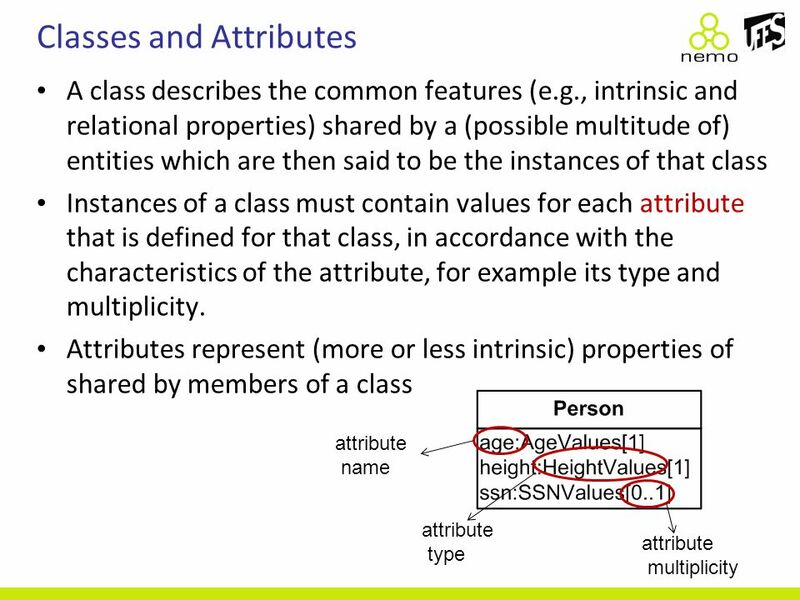 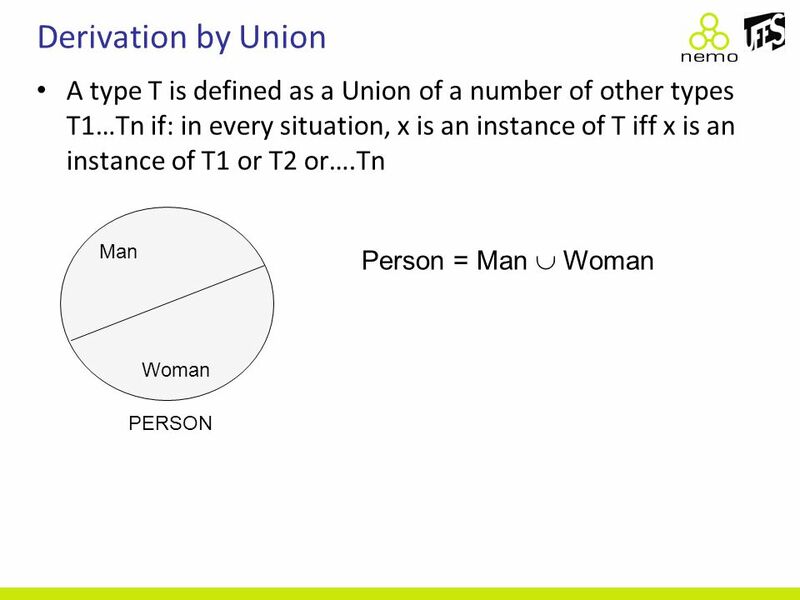 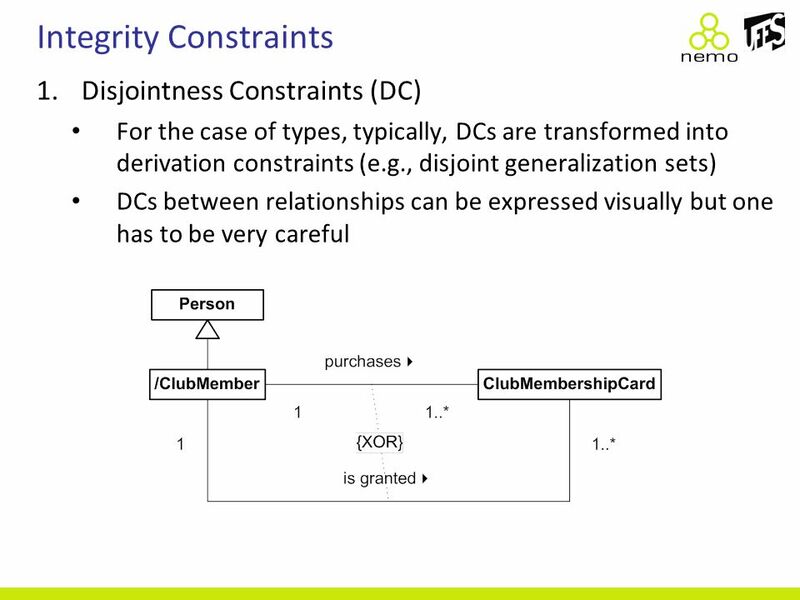 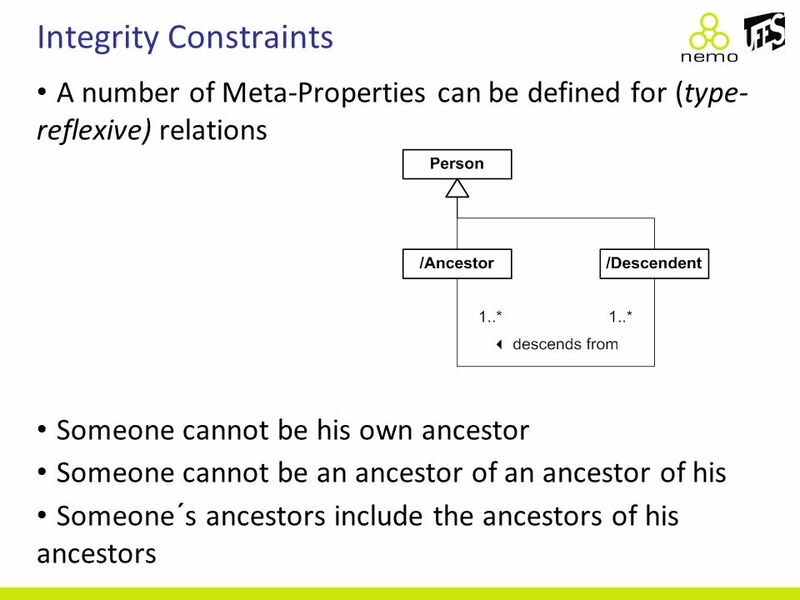 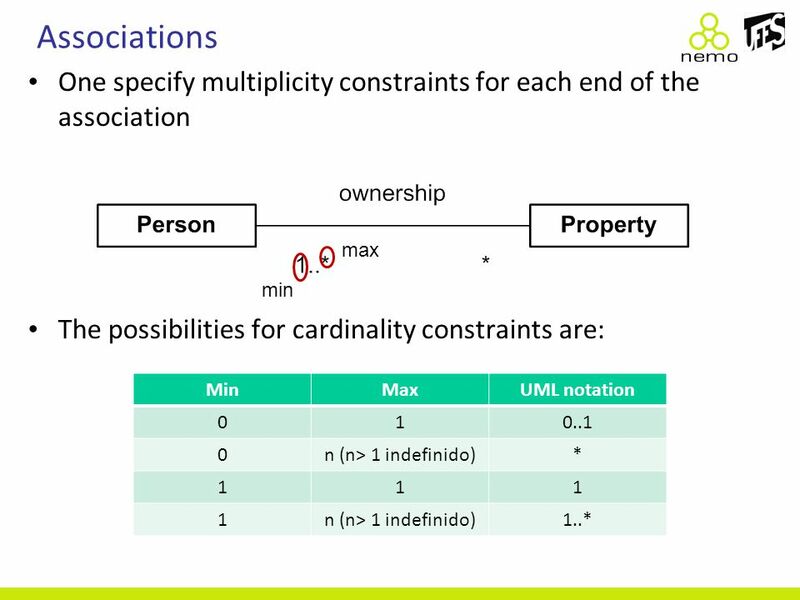 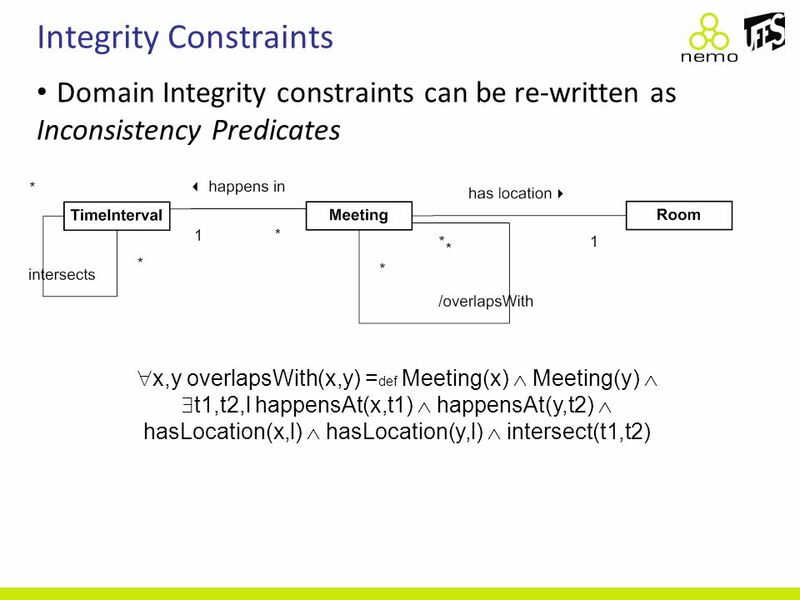 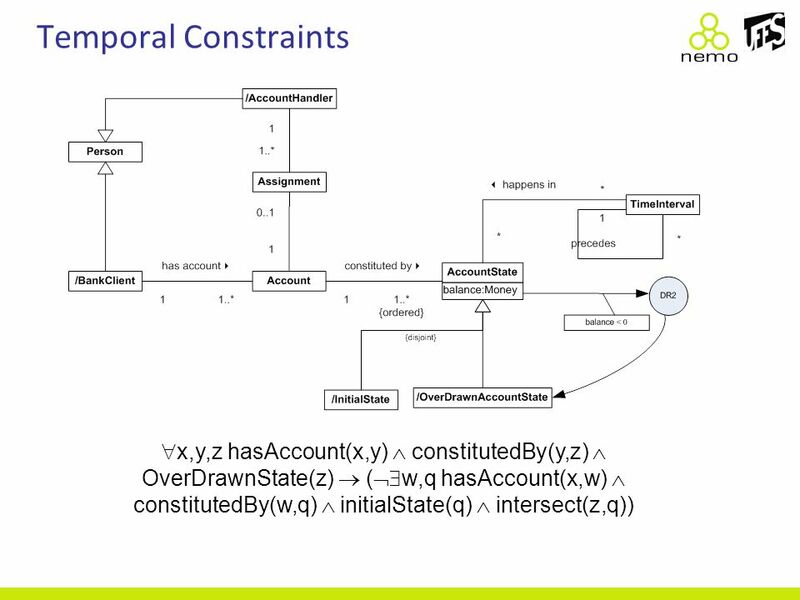 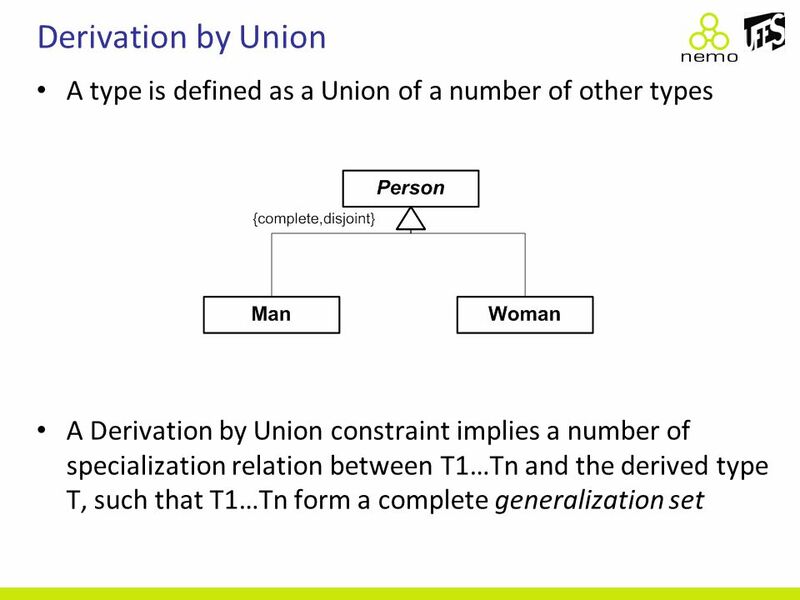 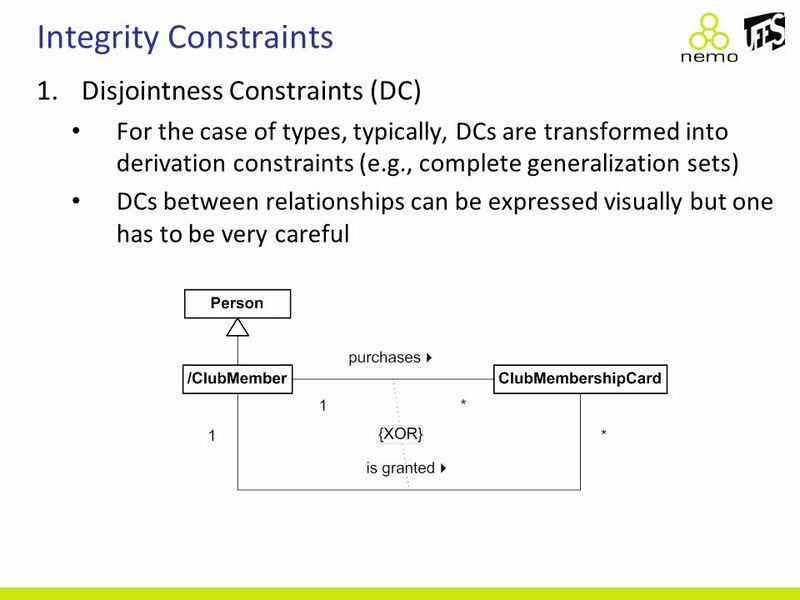 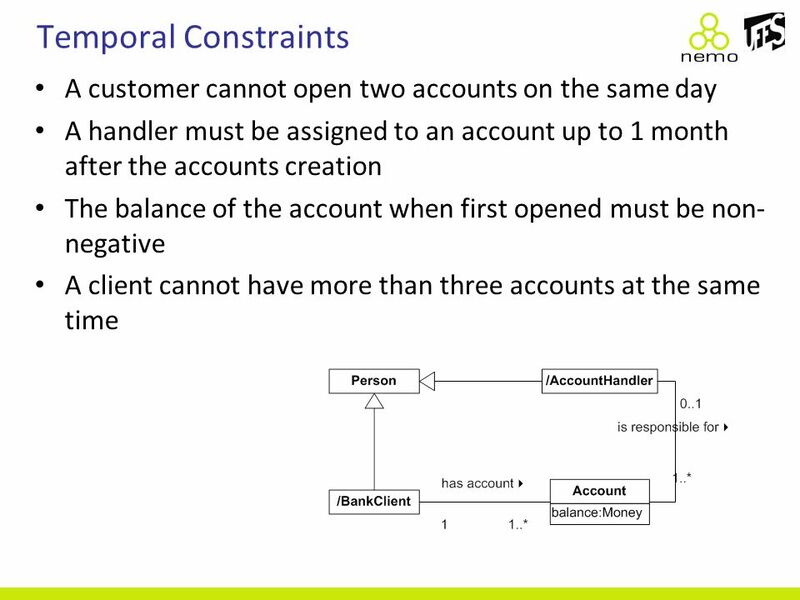 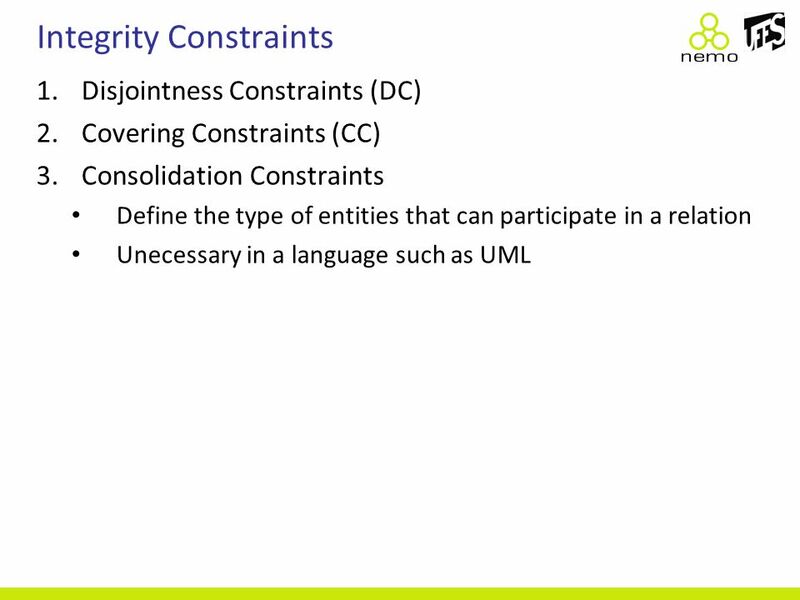 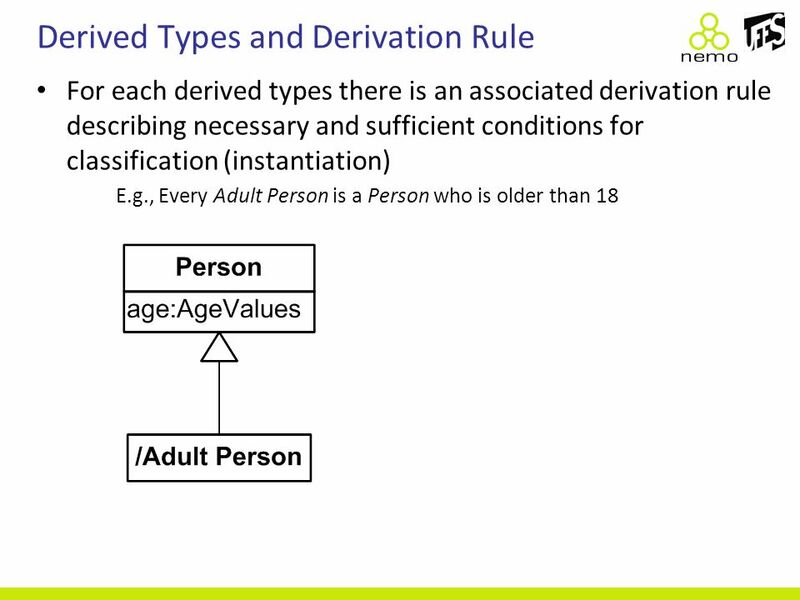 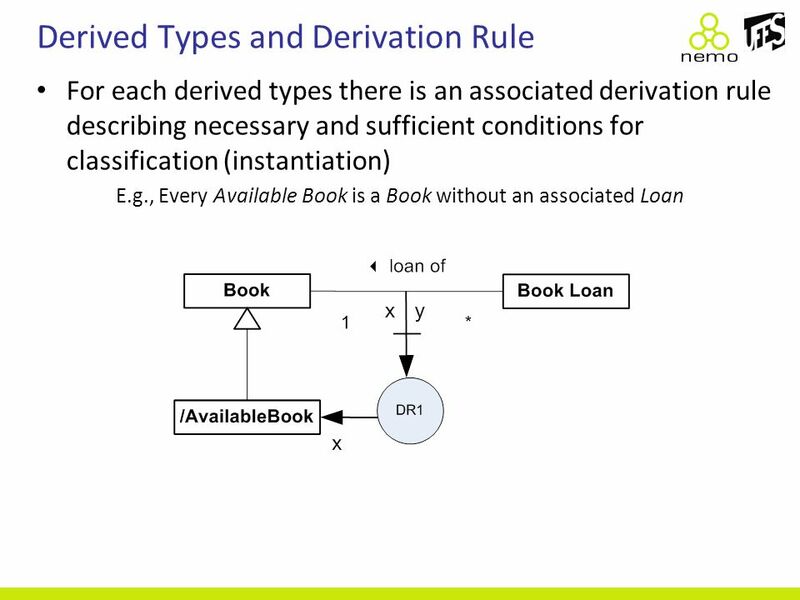 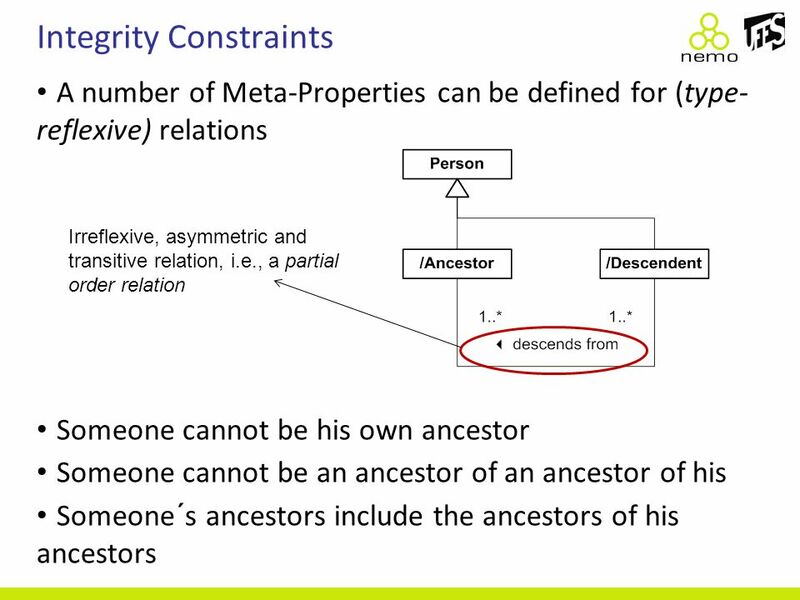 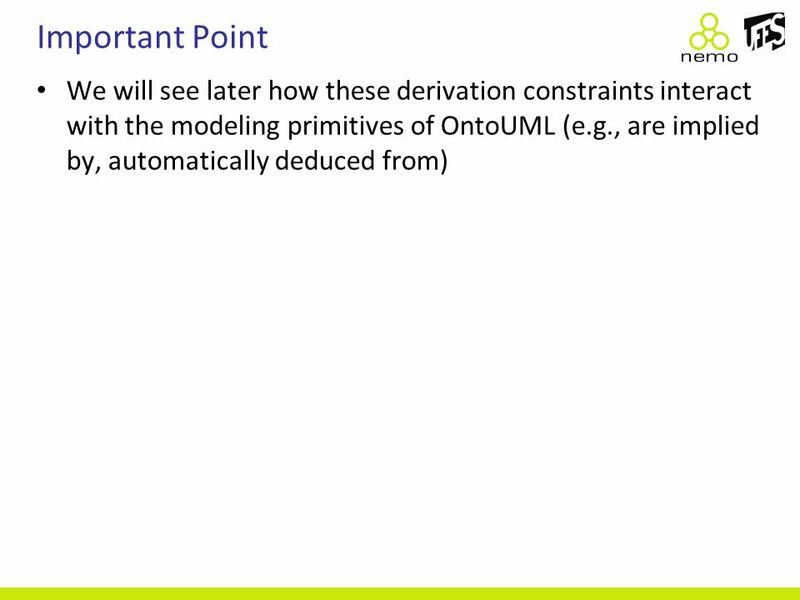 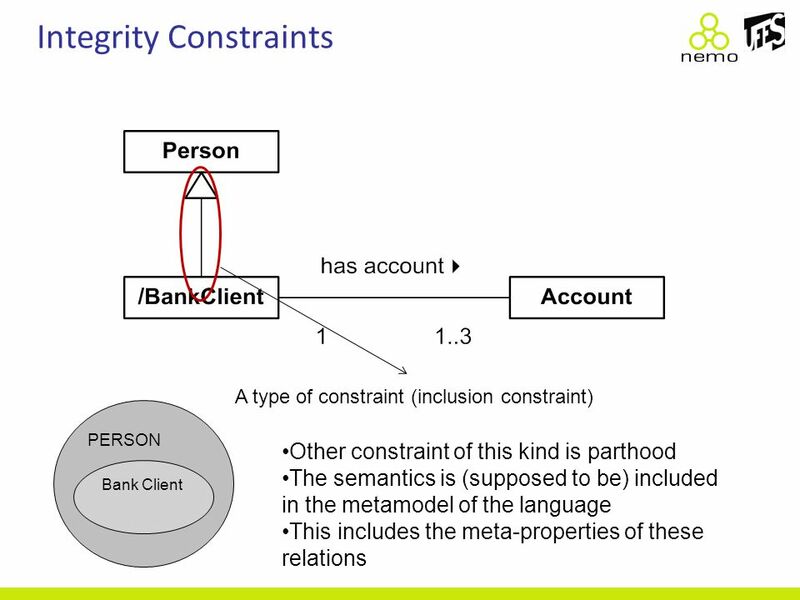 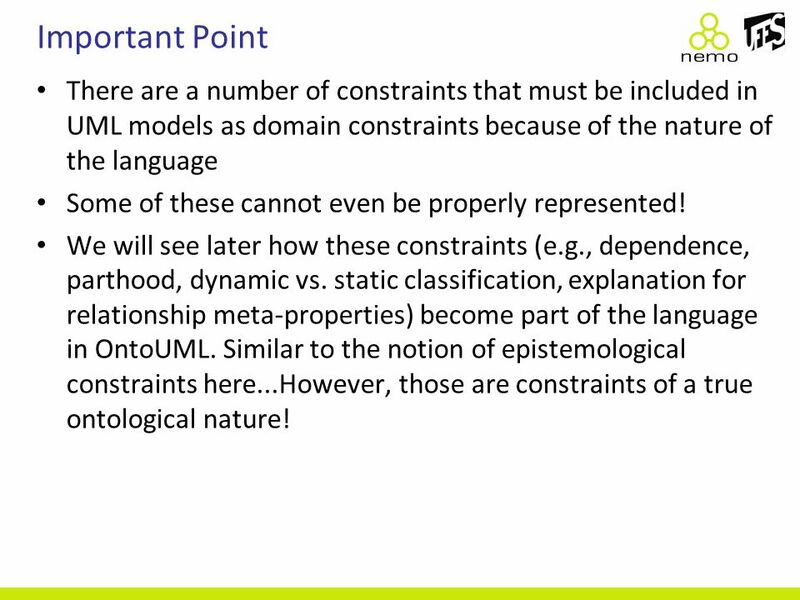 91 Important Point There are a number of constraints that must be included in UML models as domain constraints because of the nature of the language Some of these cannot even be properly represented! 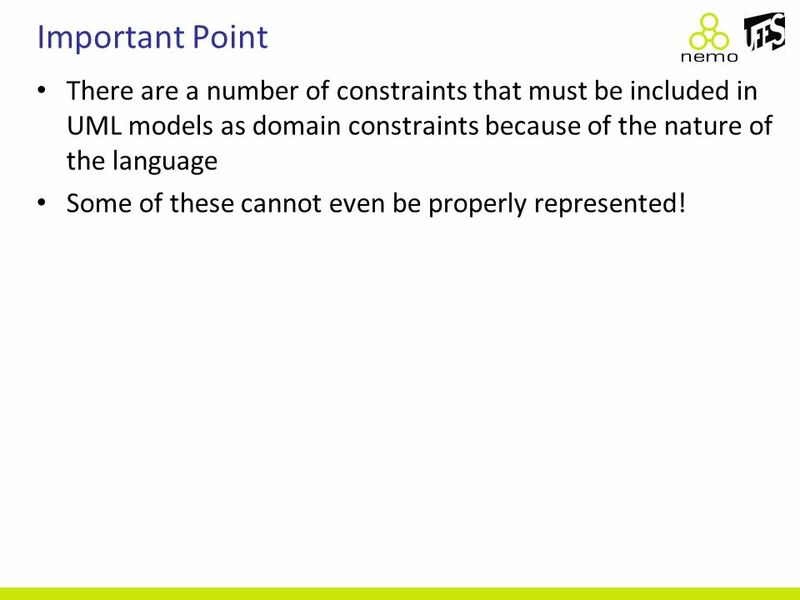 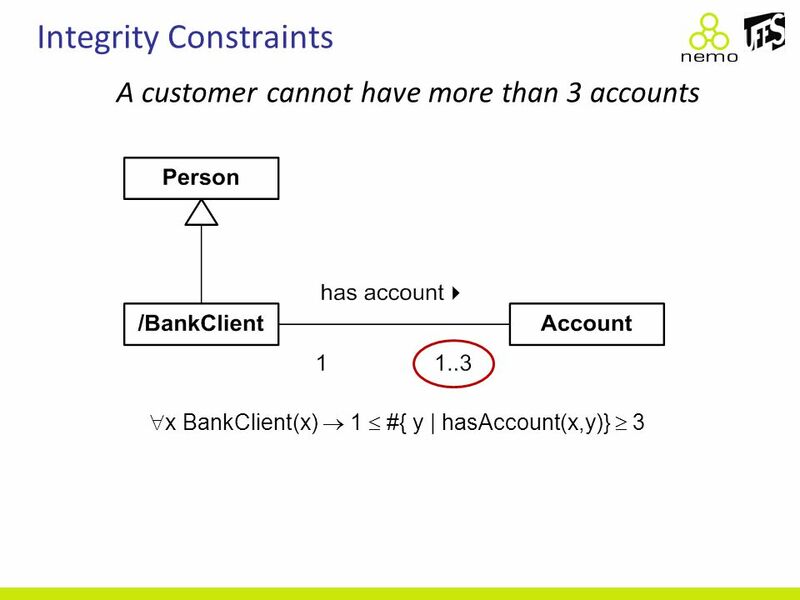 93 Important Point There are a number of constraints that must be included in UML models as domain constraints because of the nature of the language Some of these cannot even be properly represented! 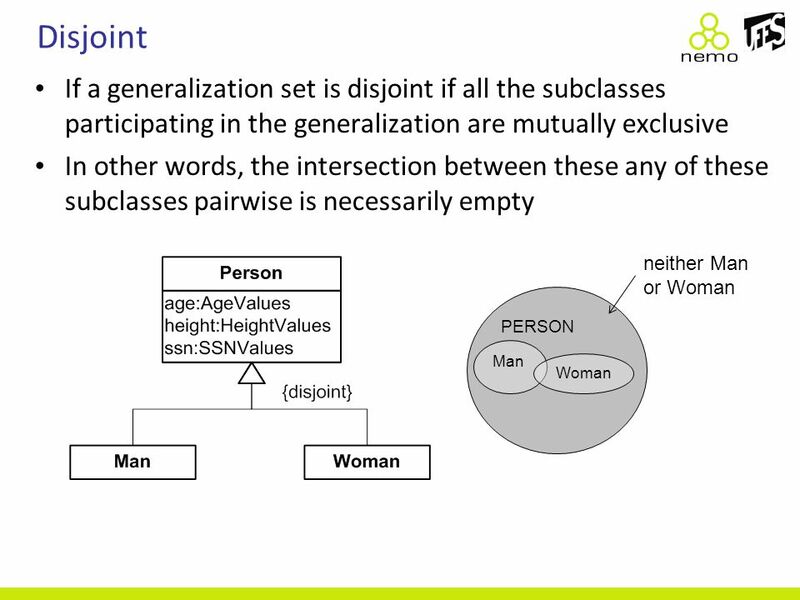 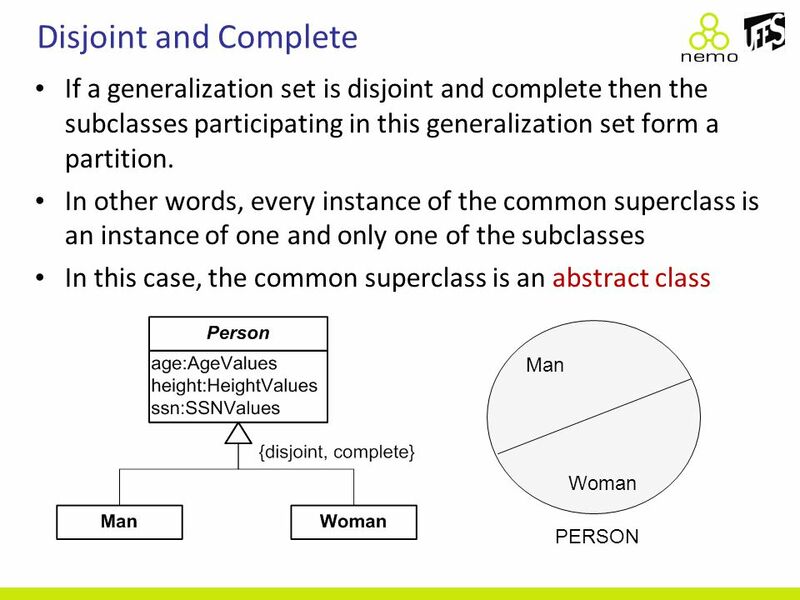 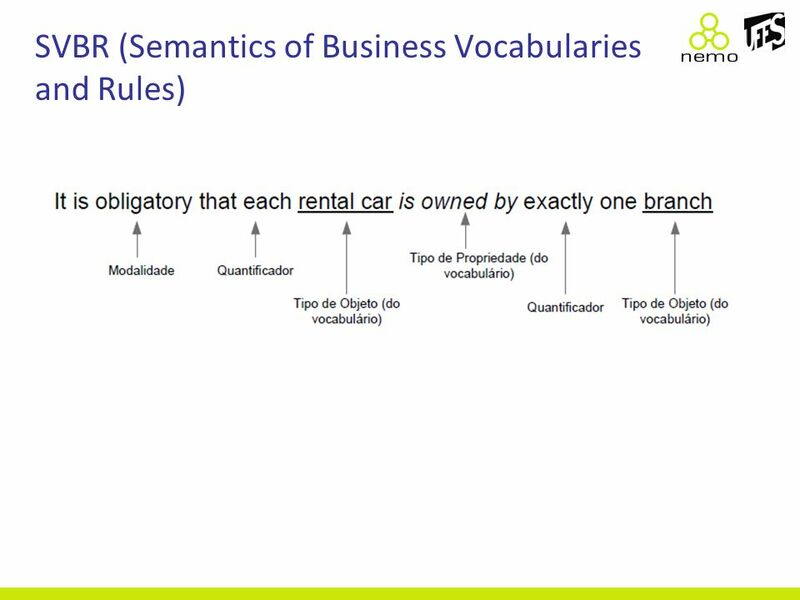 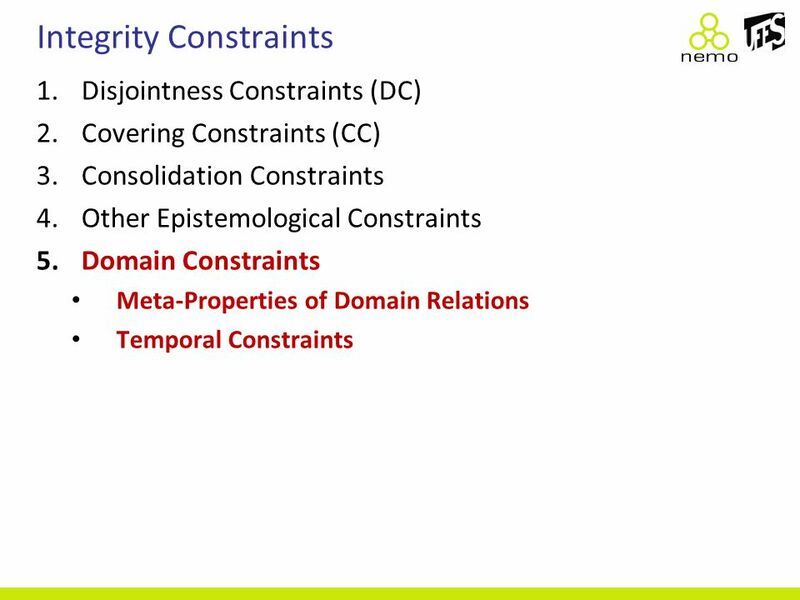 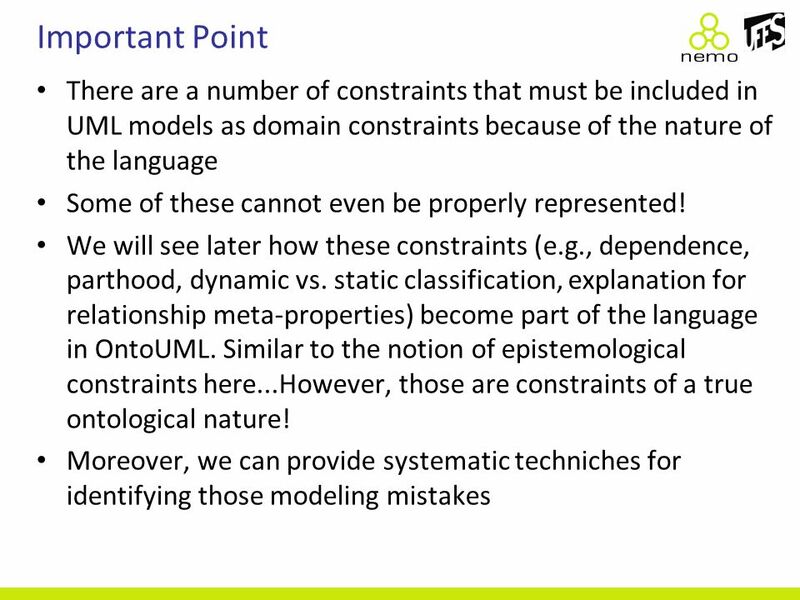 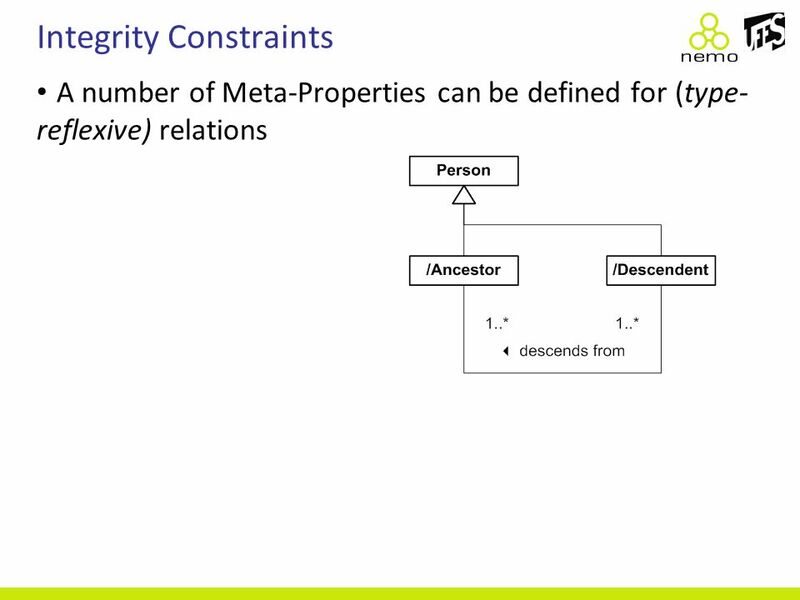 We will see later how these constraints (e.g., dependence, parthood, dynamic vs. static classification, explanation for relationship meta-properties) become part of the language in OntoUML. 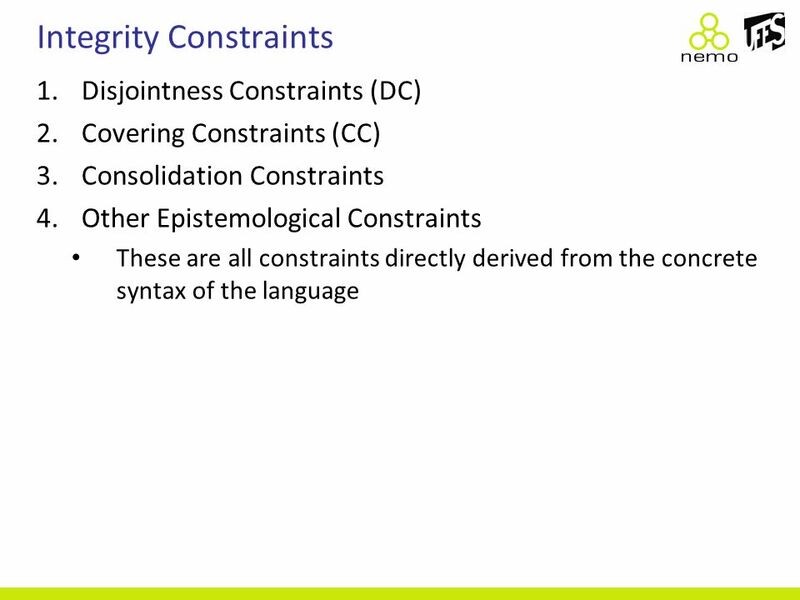 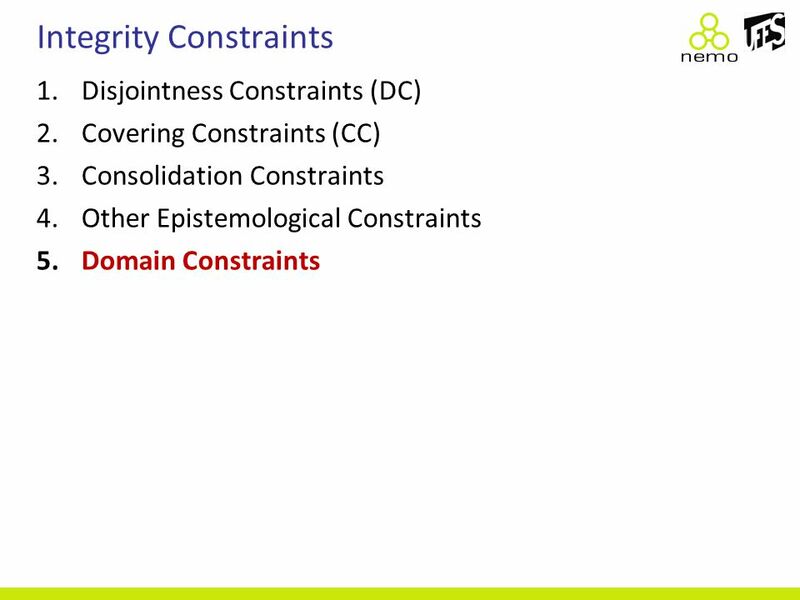 Similar to the notion of epistemological constraints here...However, those are constraints of a true ontological nature! 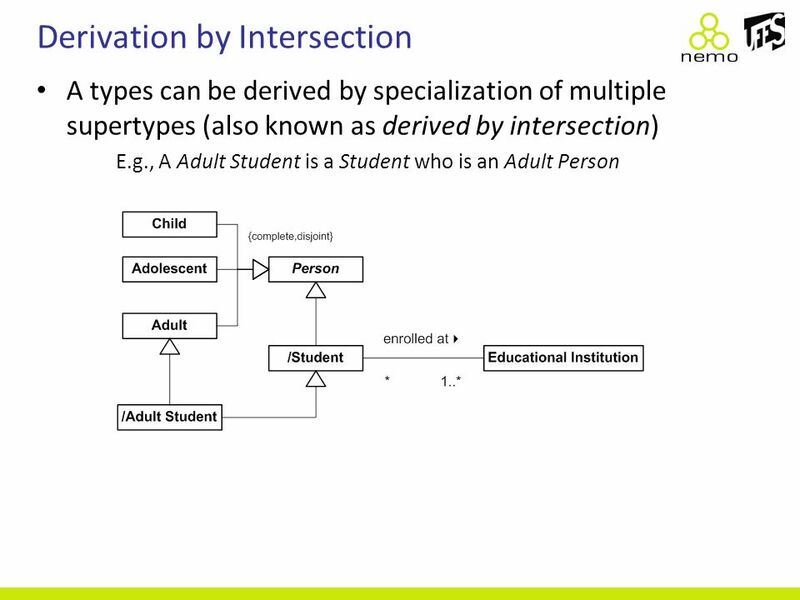 Download ppt "Artificial Intelligence Giancarlo Guizzardi Computer Science Department Federal University." 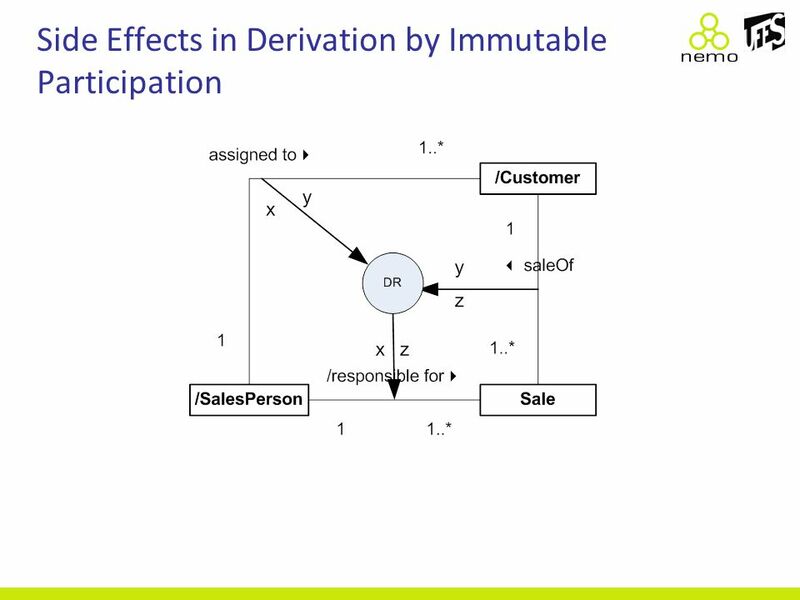 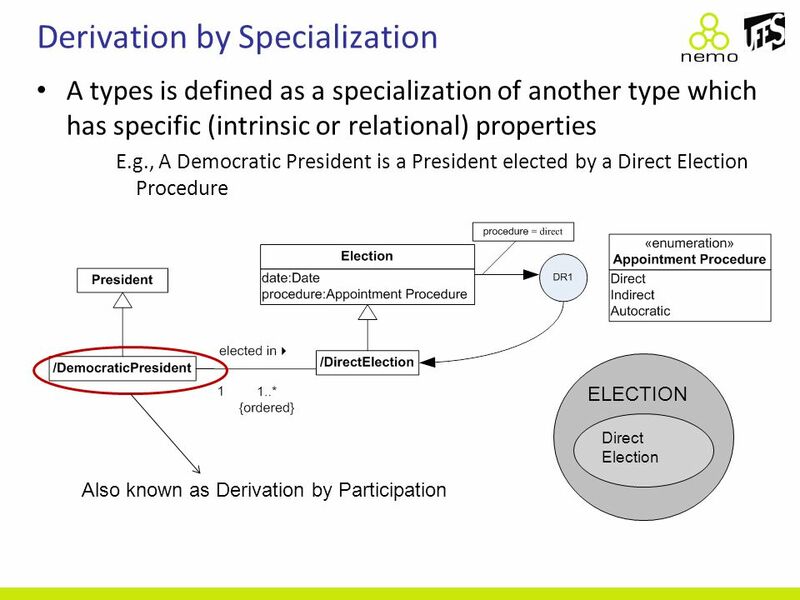 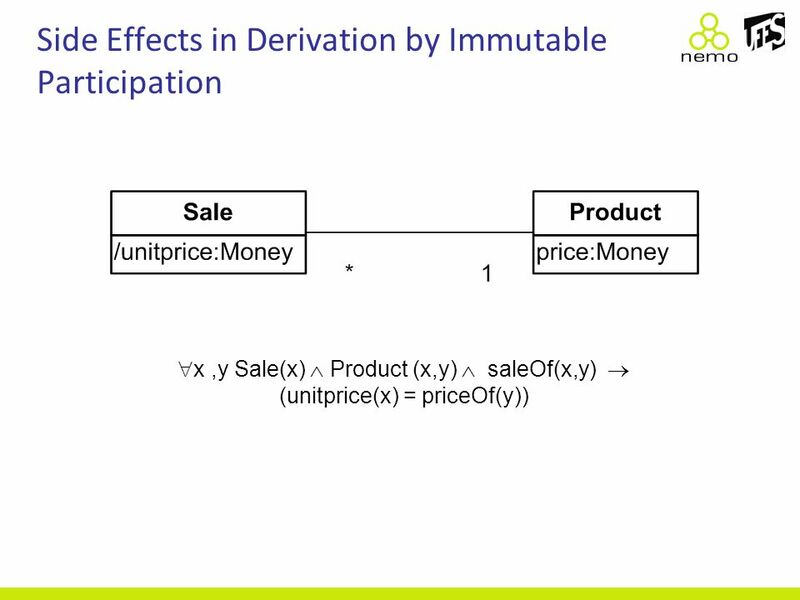 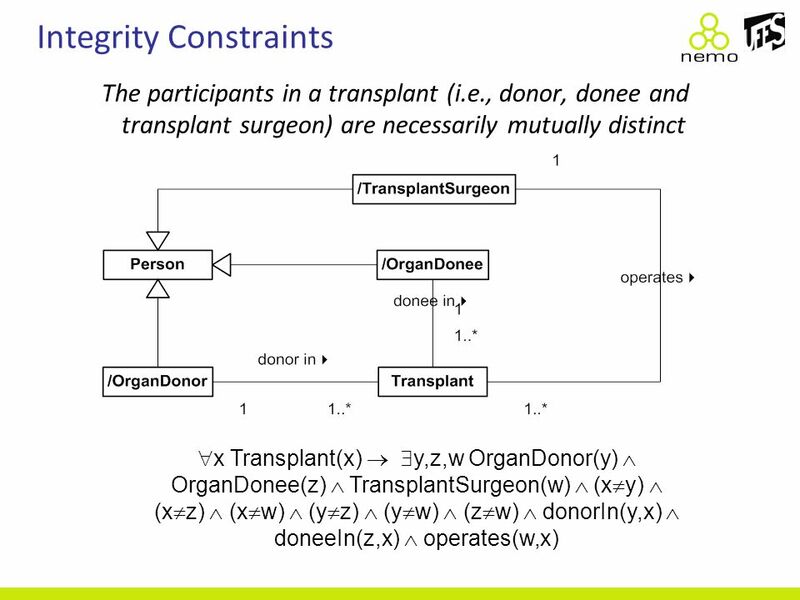 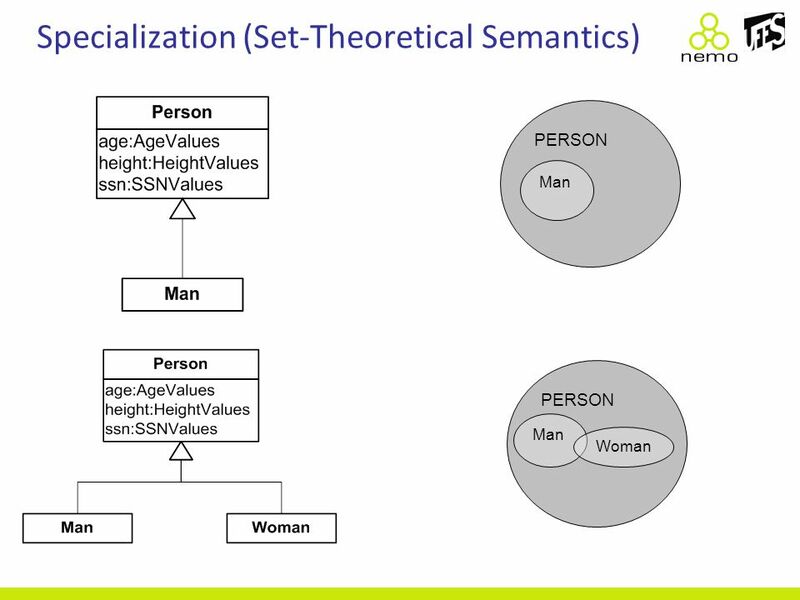 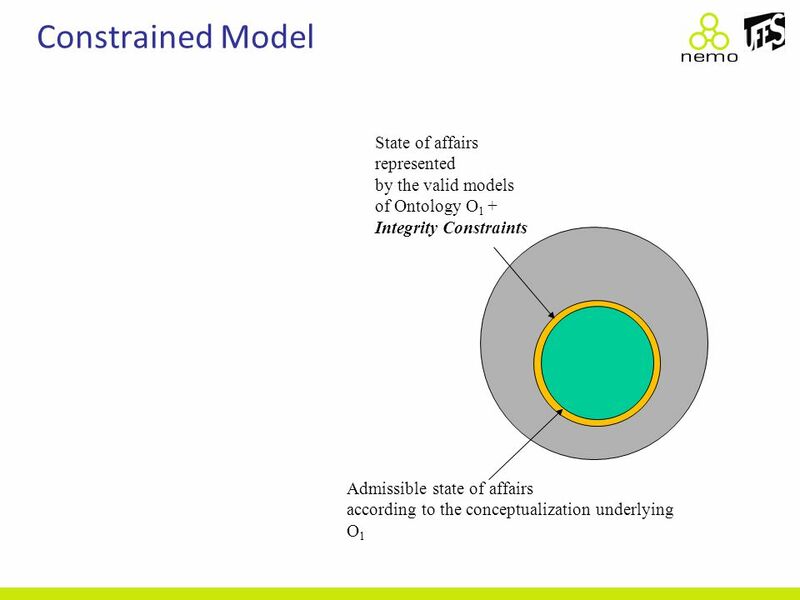 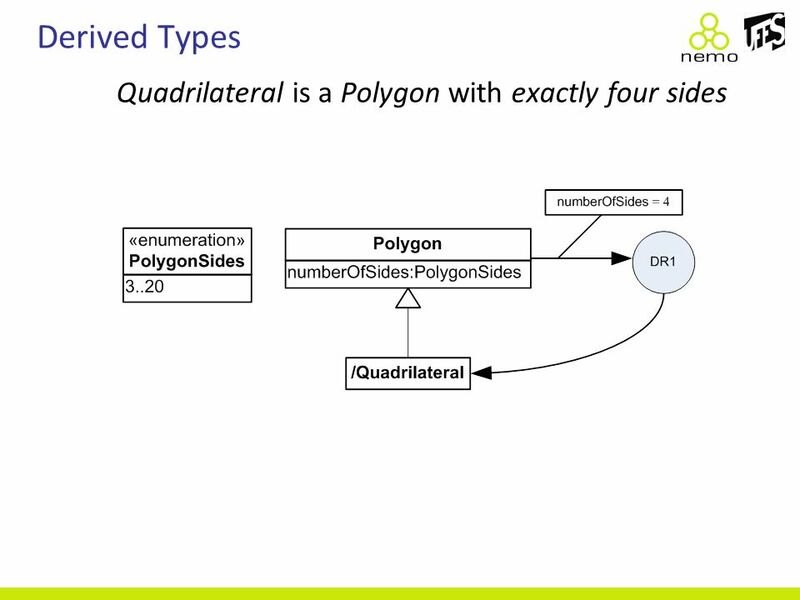 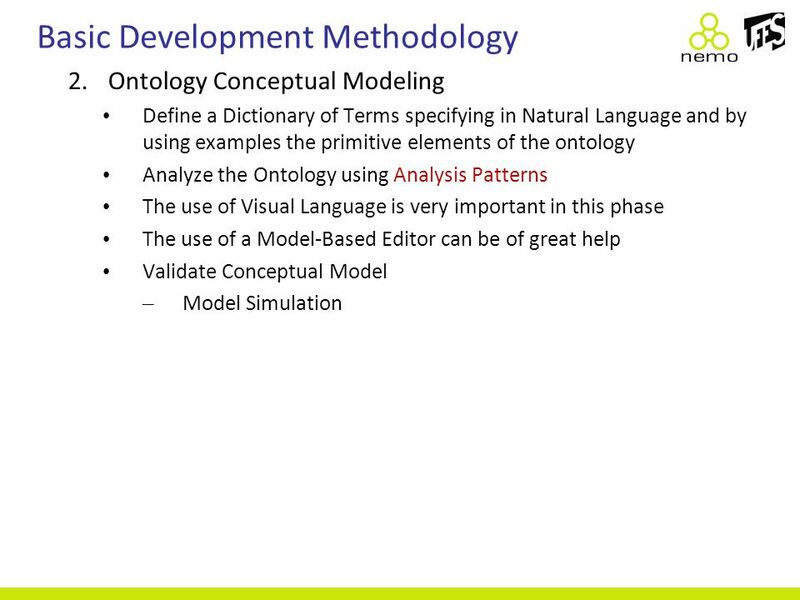 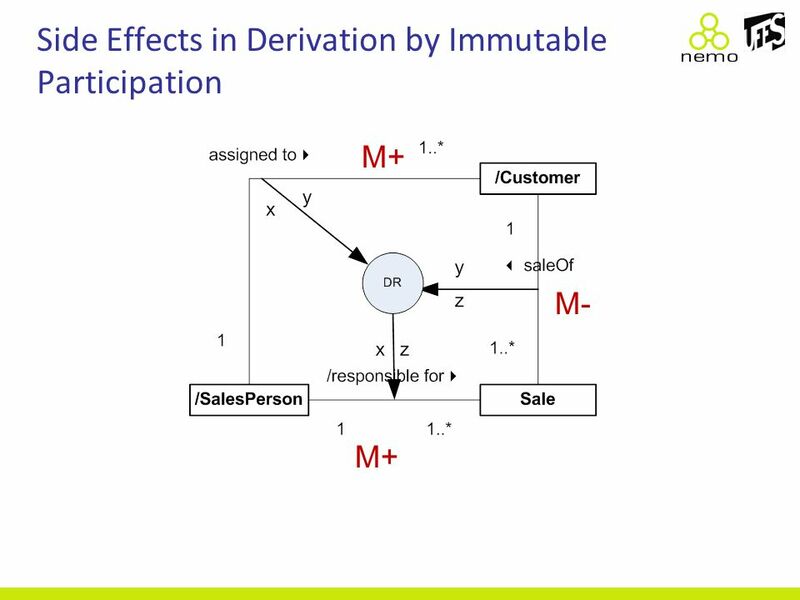 Ontology-Driven Conceptual Modeling with Applications Giancarlo Guizzardi Computer Science. 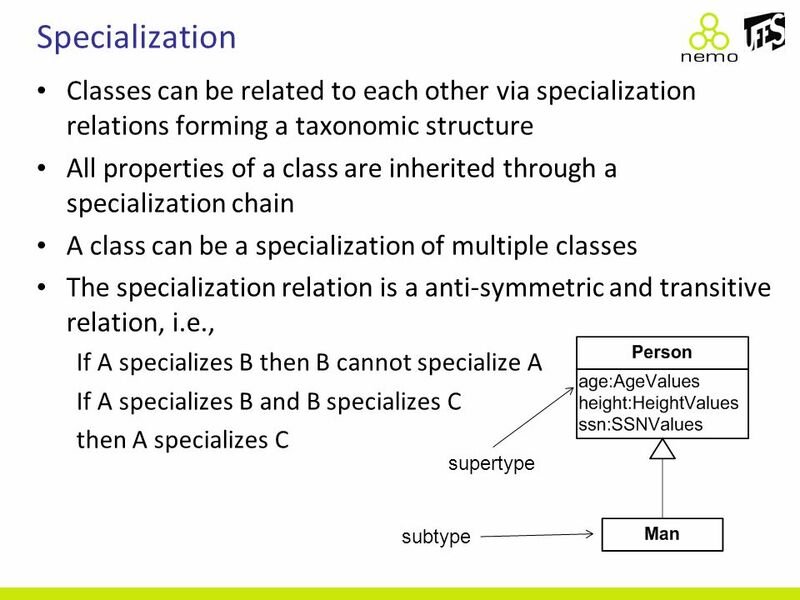 E © 2002 Dario Aganovic Resource Description Framework Schema (RDFS) Dario Aganovic Industrial PhD-student NPI Production Kista, Ericsson AB and Production. 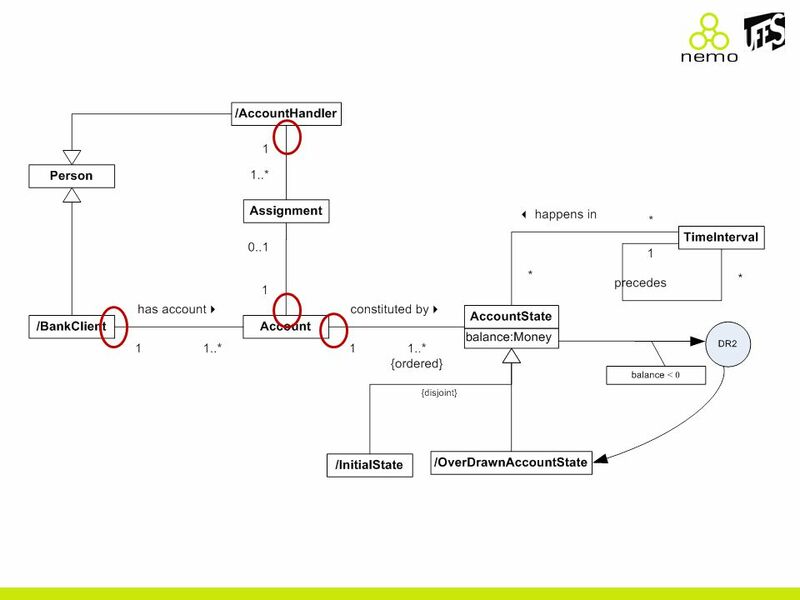 CS 340 UML Class Diagrams. 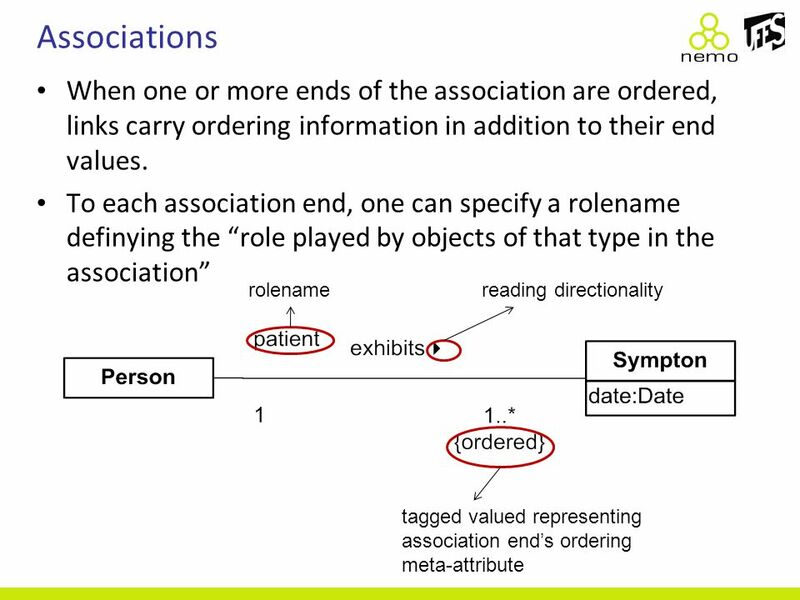 A model is an abstraction of a system, specifying the modeled system from a certain viewpoint and at a certain level of abstraction. 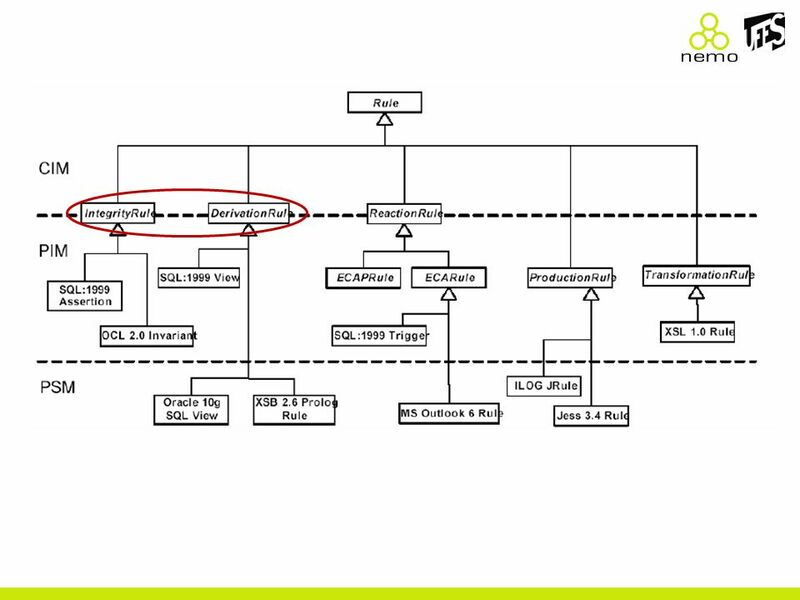 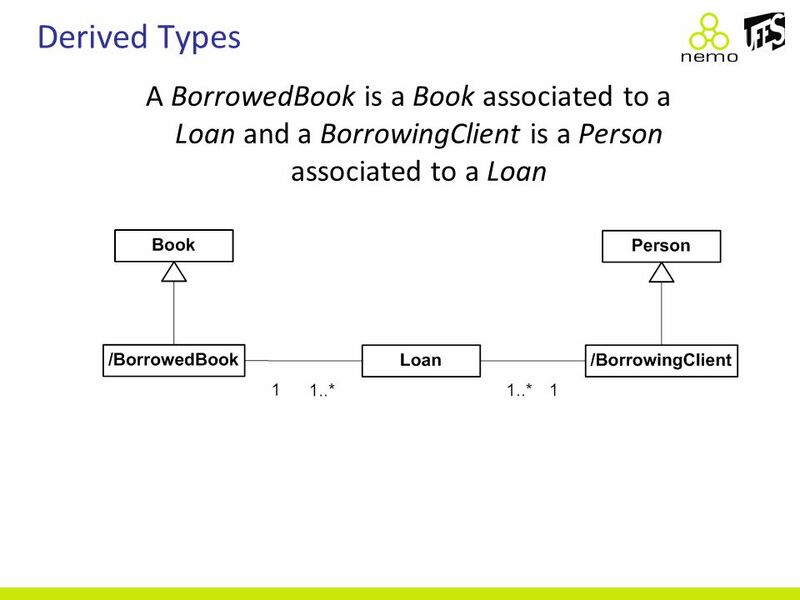 Copyright © 2007 Ramez Elmasri and Shamkant B. Navathe Slide 4- 1. 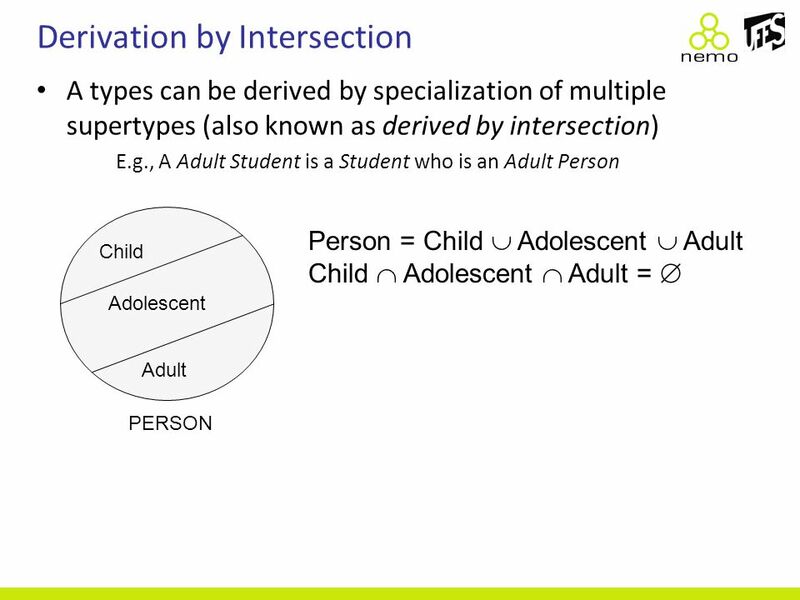 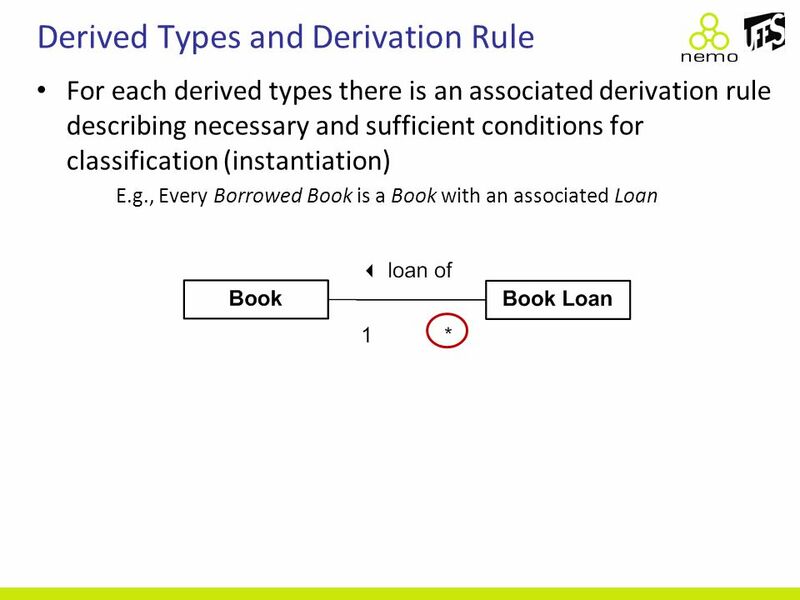 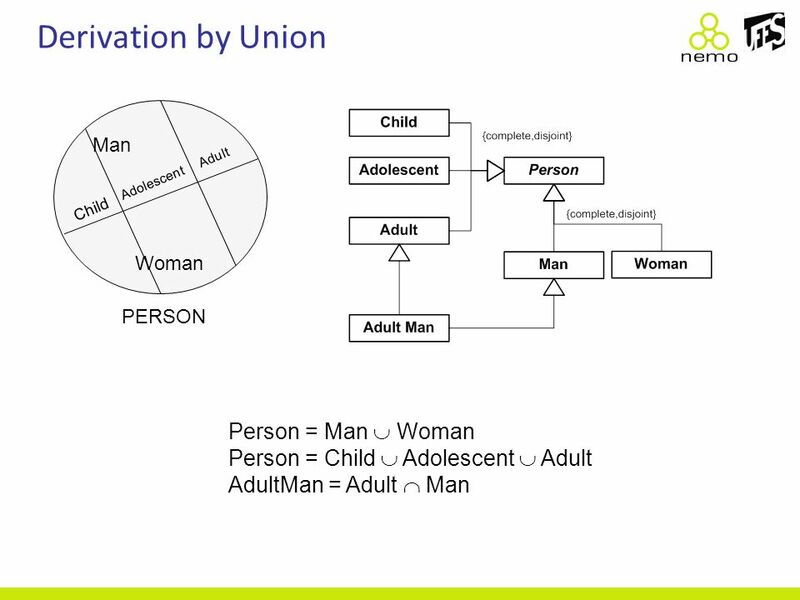 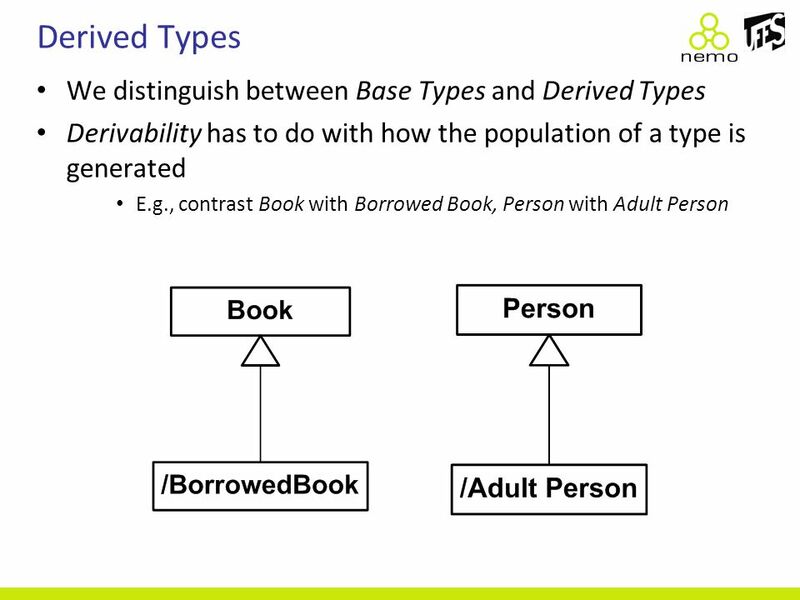 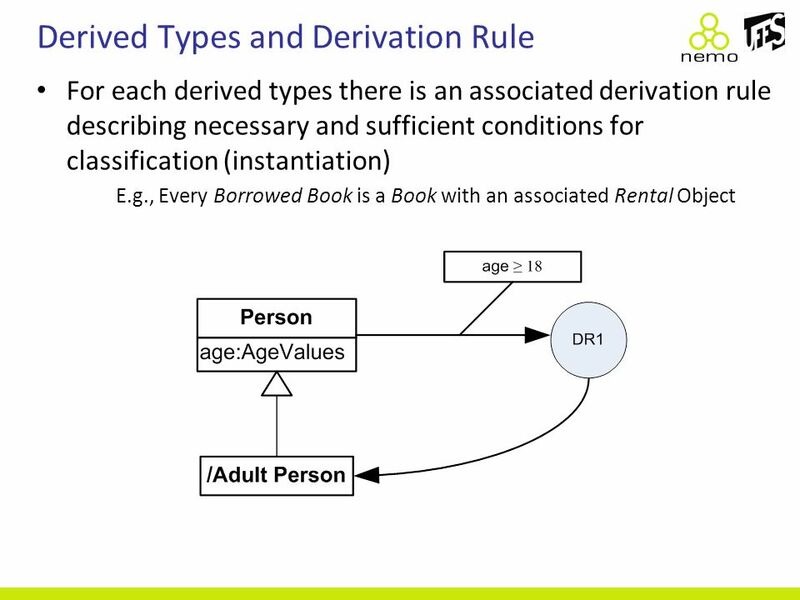 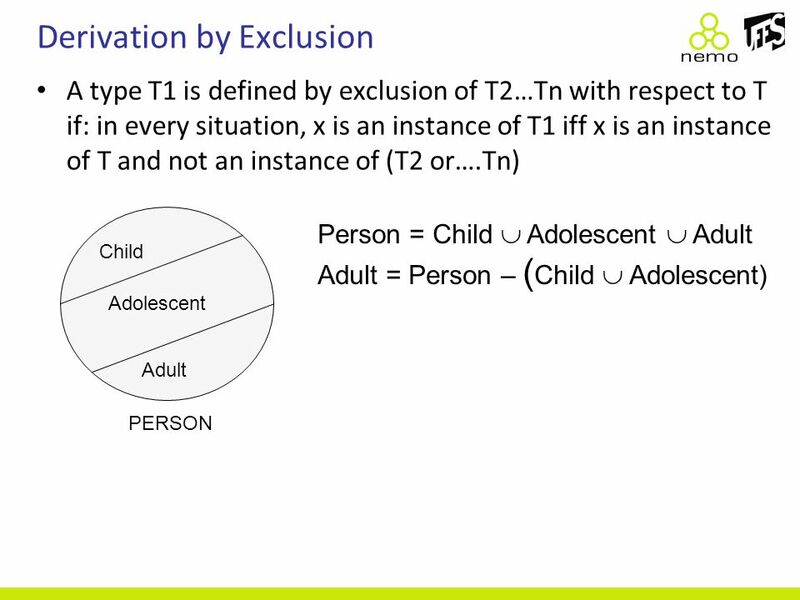 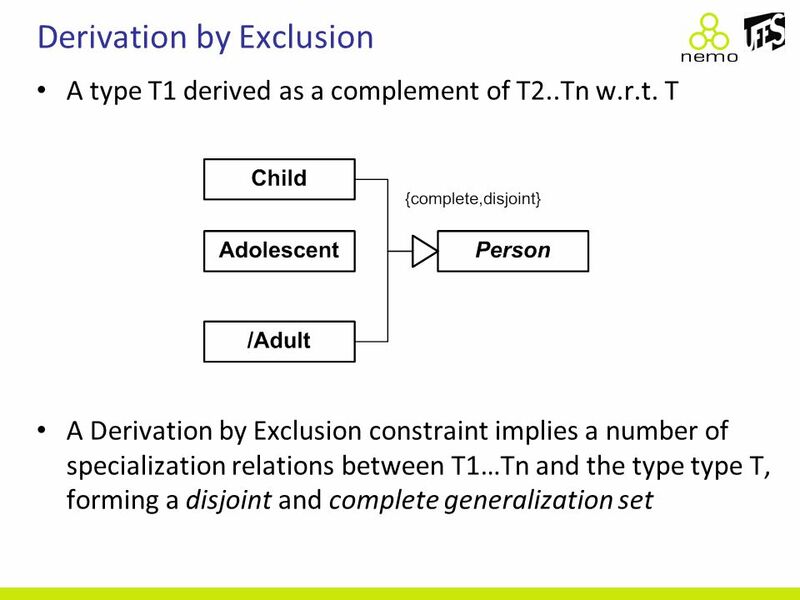 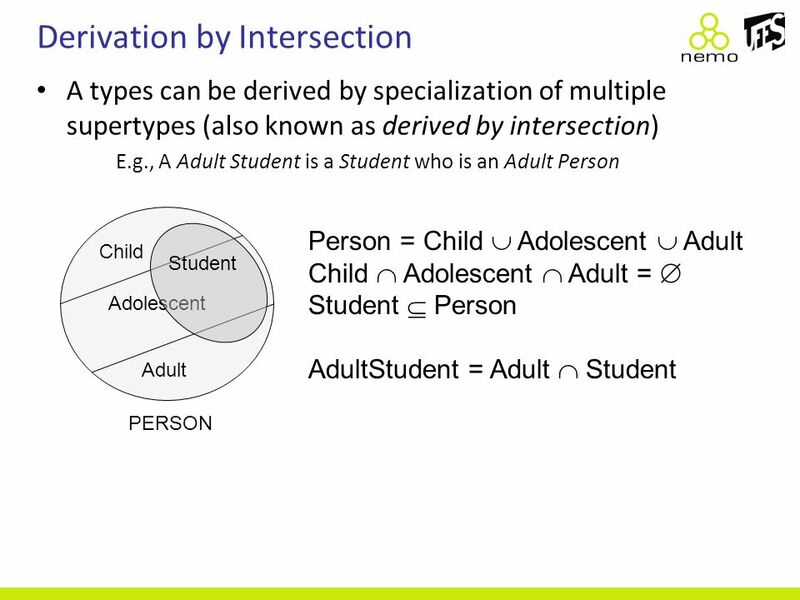 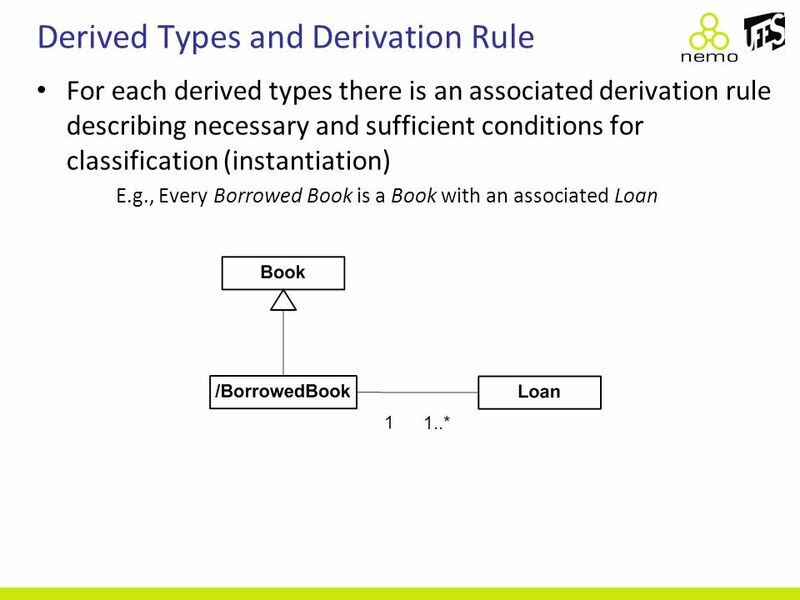 Copyright © 2011 Pearson Education, Inc. Publishing as Pearson Addison-Wesley Chapter 7 Conceptual Data Modeling Using Entities and Relationships. 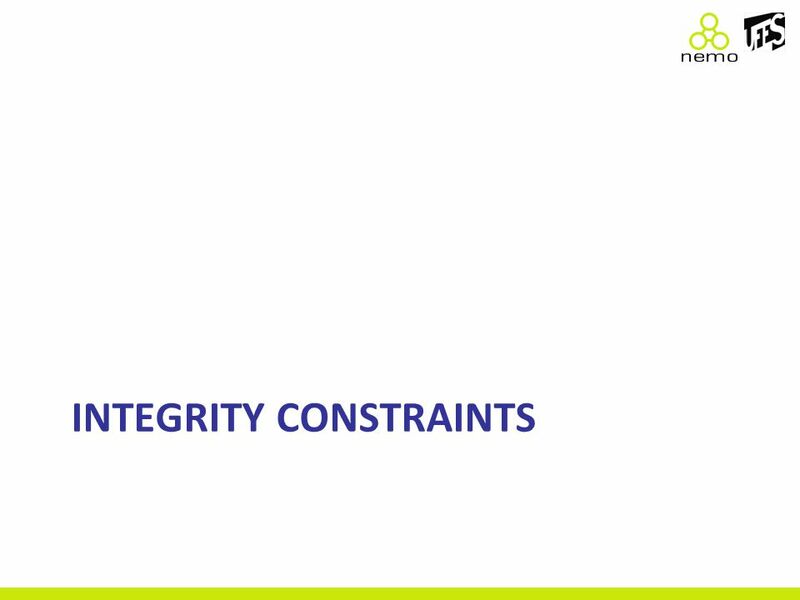 Slides adapted from A. Silberschatz et al. 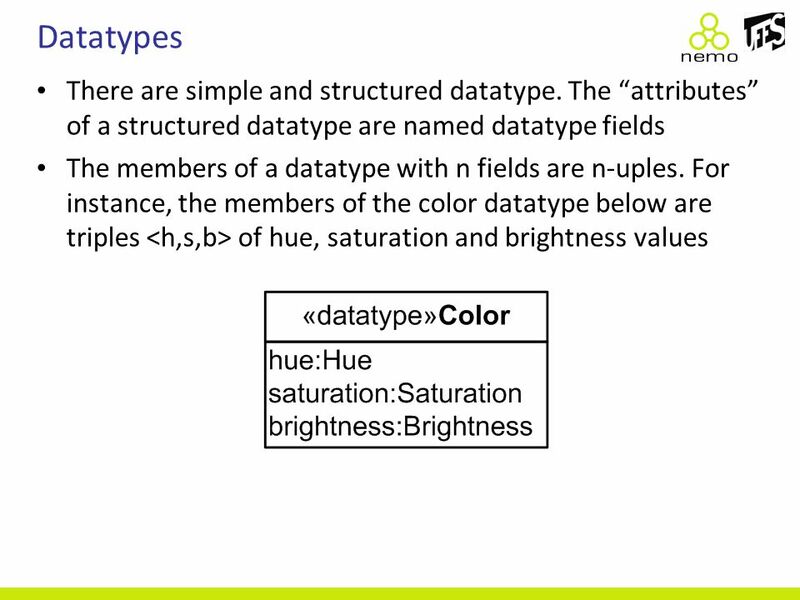 Database System Concepts, 5th Ed. 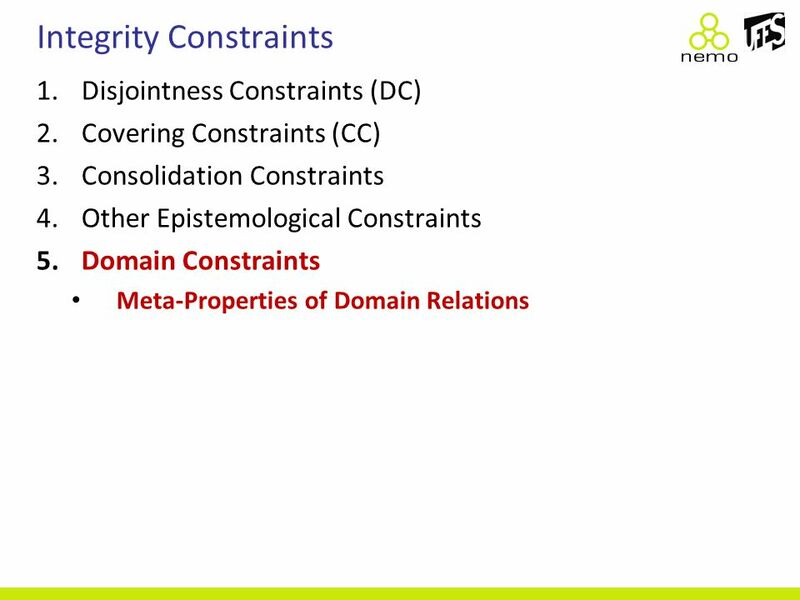 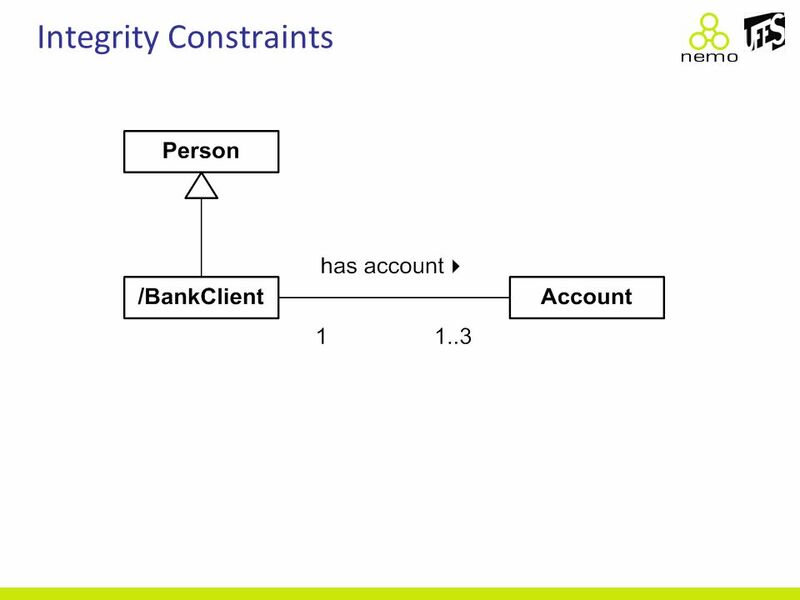 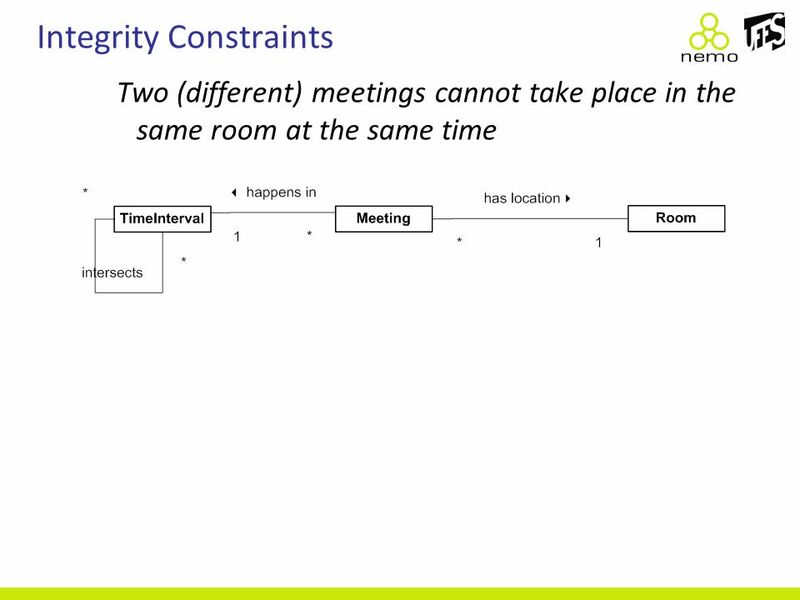 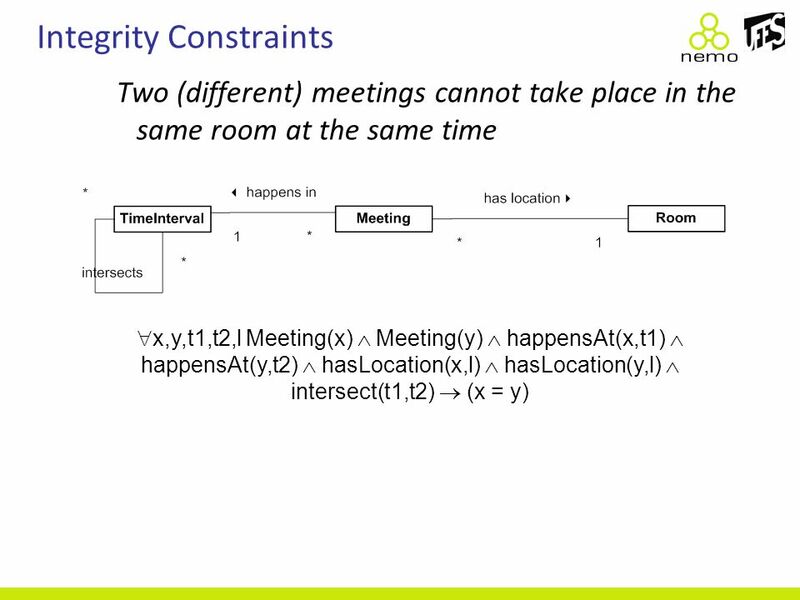 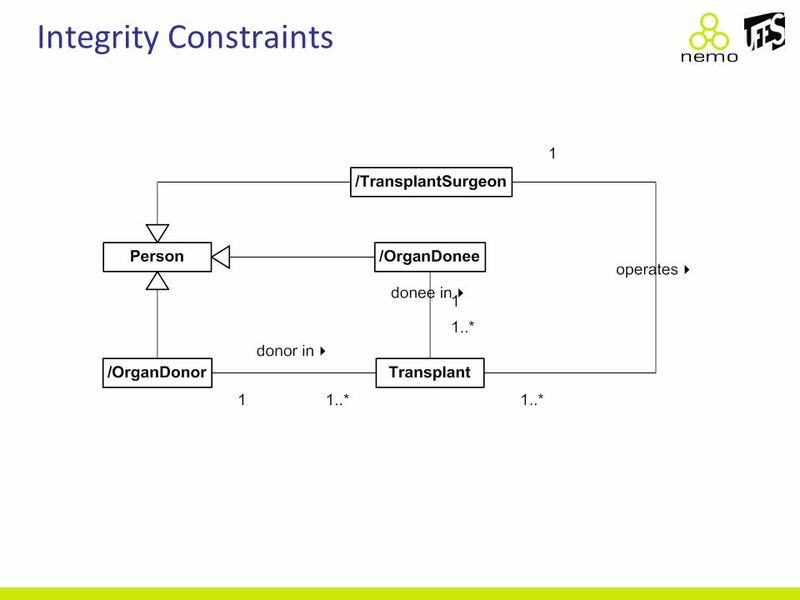 Entity-Relationship Model Database Management Systems I Alex Coman, Winter. 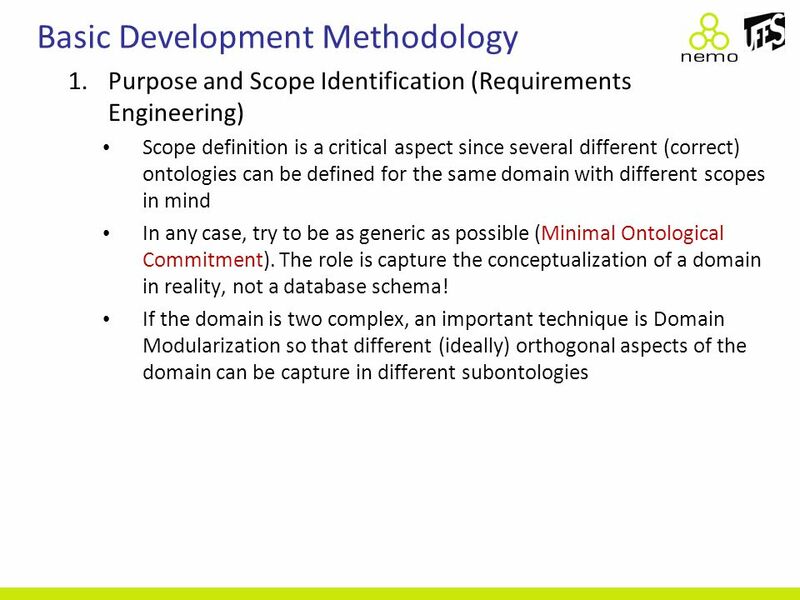 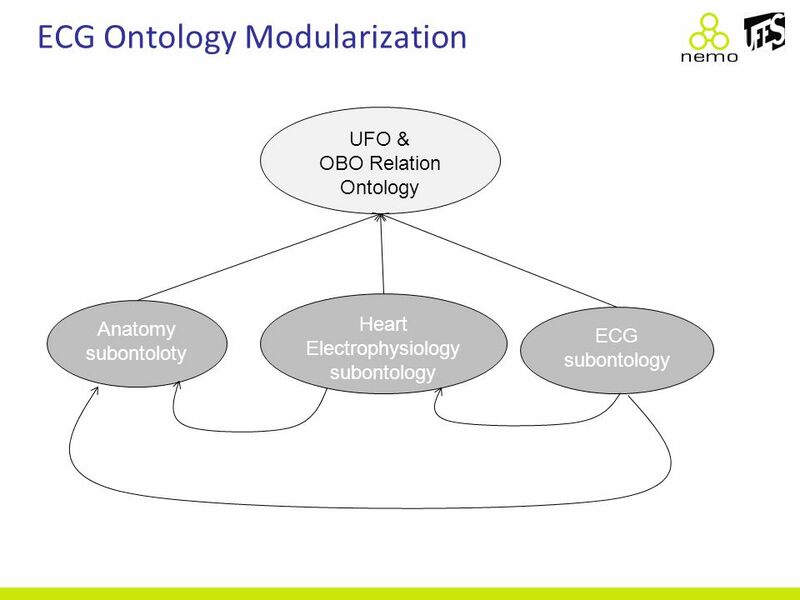 What is an Ontology? 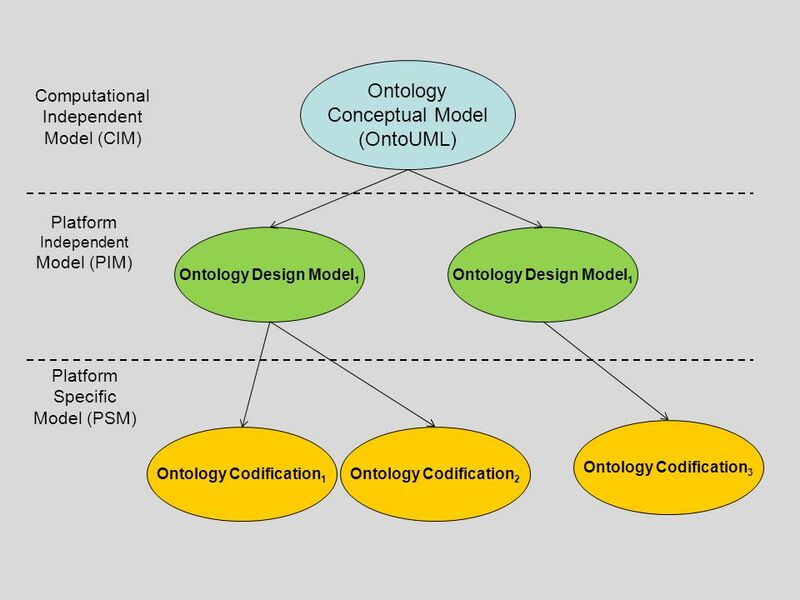 AmphibiaTree 2006 Workshop Saturday 8:45–9:15 A. Maglia. 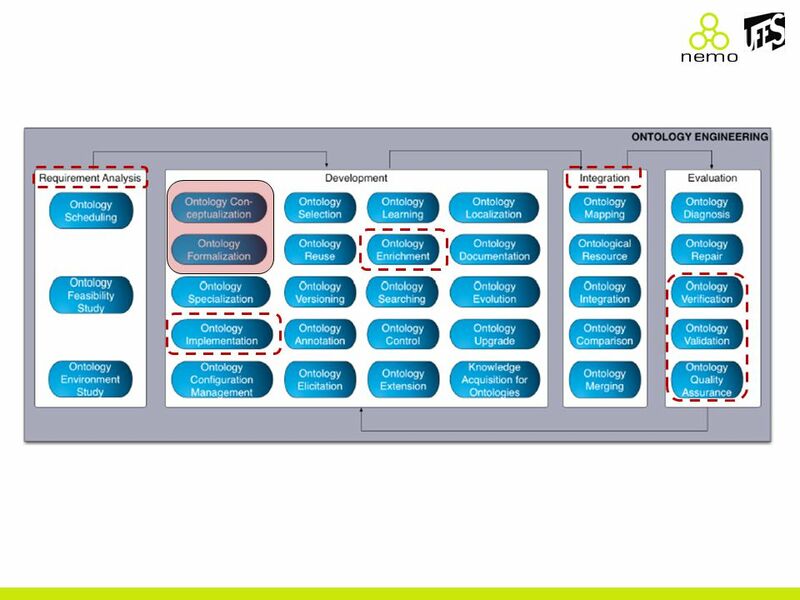 Foundations This chapter lays down the fundamental ideas and choices on which our approach is based. 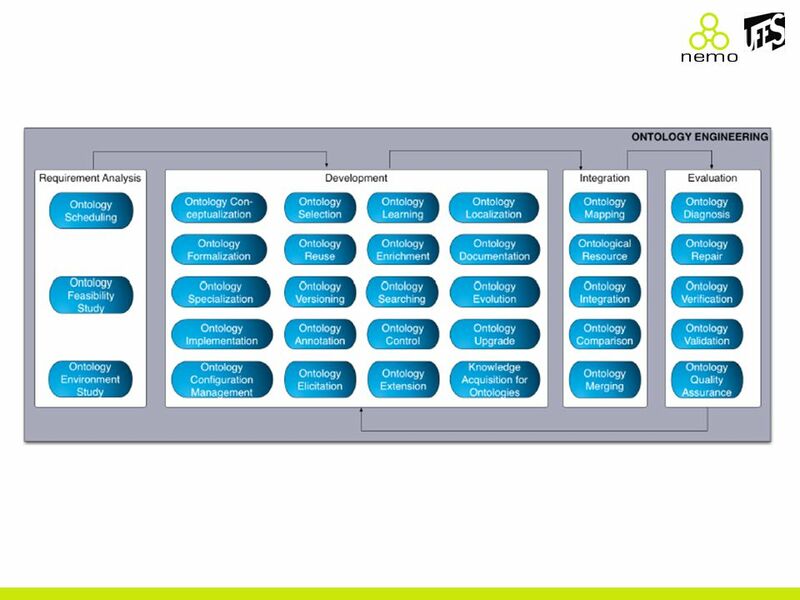 First, it identifies the needs of architects in the. 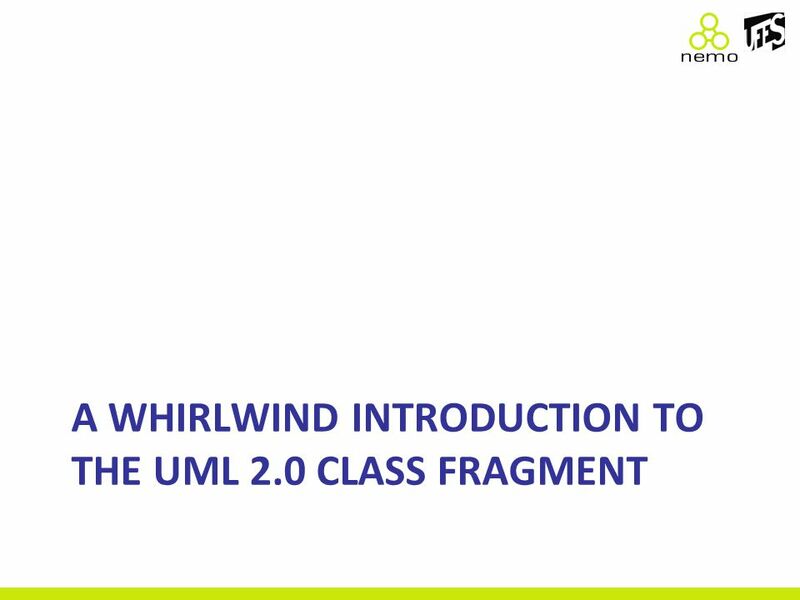 UML Class Diagrams: Basic Concepts. 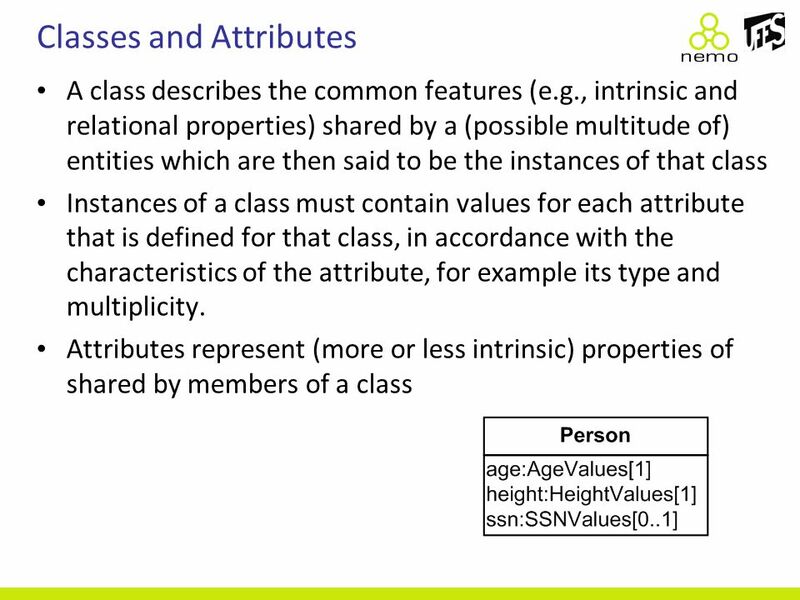 Objects –The purpose of class modeling is to describe objects. 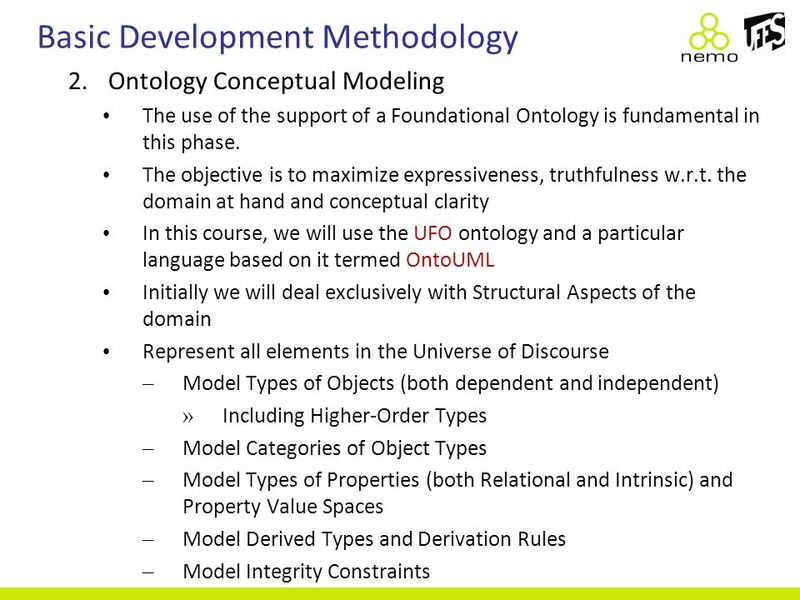 –An object is a concept, abstraction or thing that. 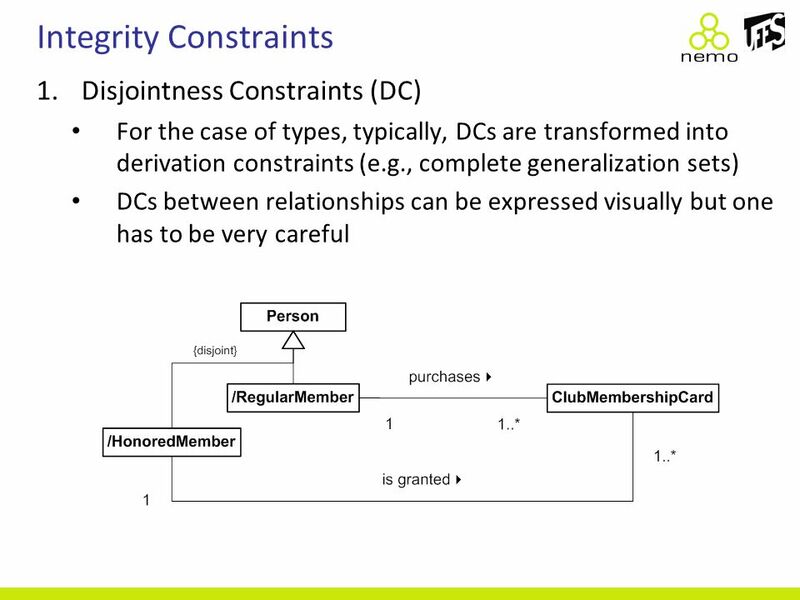 Enhanced Entity Relationship Modeling © 2002 by Dietrich and Urban1 ADVANCED DATABASE CONCEPTS Enhanced Entity Relationship Modeling Susan D. Urban and. 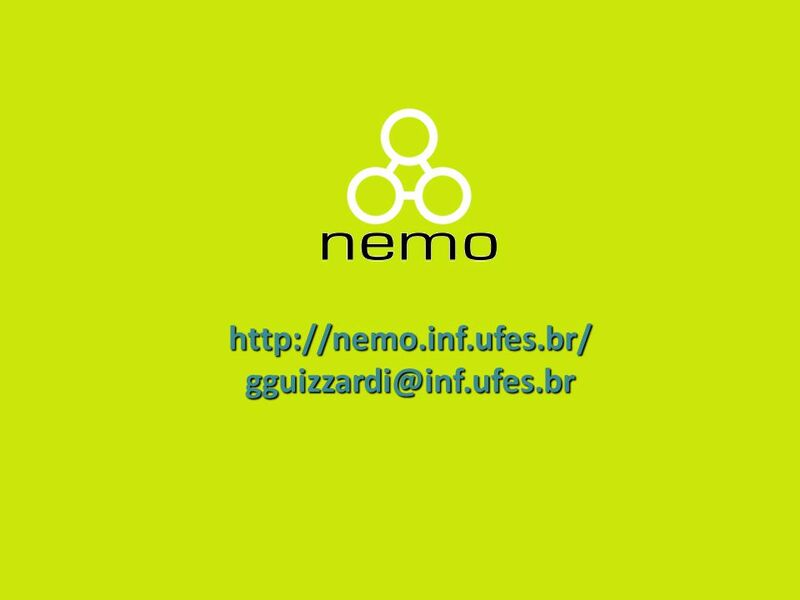 DeSiamorewww.desiamore.com/ifm1 Database Management Systems (DBMS)  B. 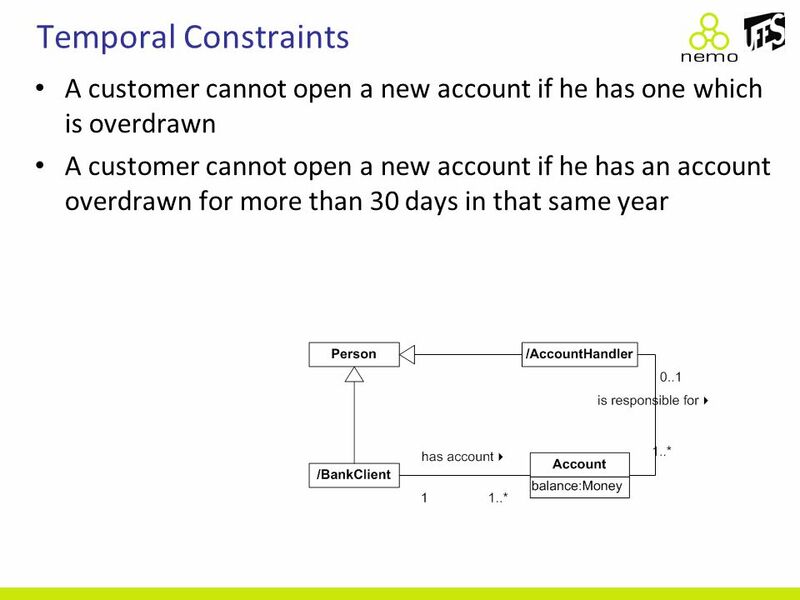 Computer Science and BSc IT Year 1.